A new flyby of the USS Enterprise-D, filmed with the 4-foot model, was created for the fourth season of TNG. 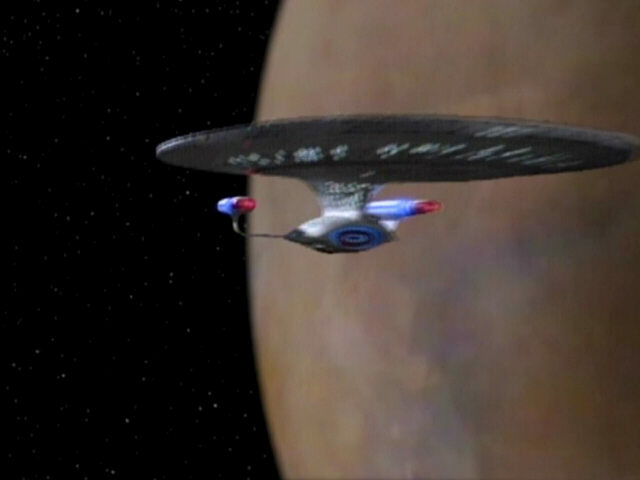 Three versions of this shot exist in the original SD episodes. 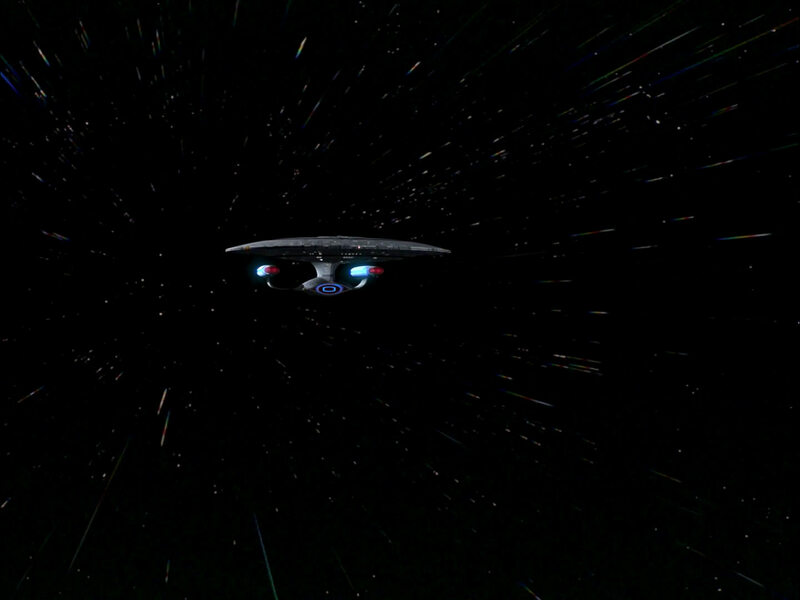 One features the ship flying towards the camera at impulse and another one at warp speed. 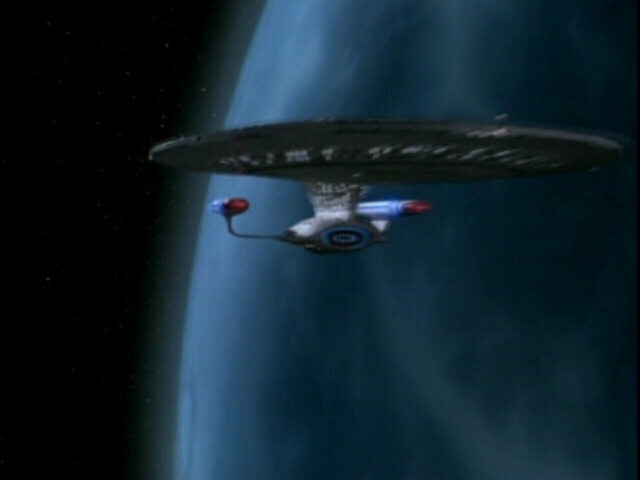 The footage of the USS Enterprise-D is identical, only the stars were changed. 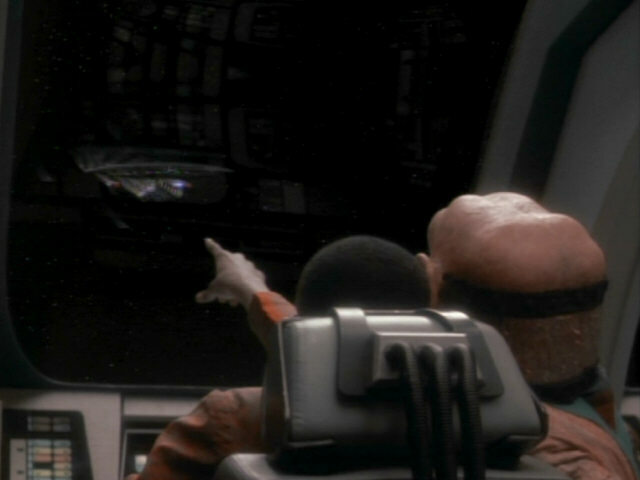 In this article, We will refer to the warp shot as 1 and the impulse shot as 3. 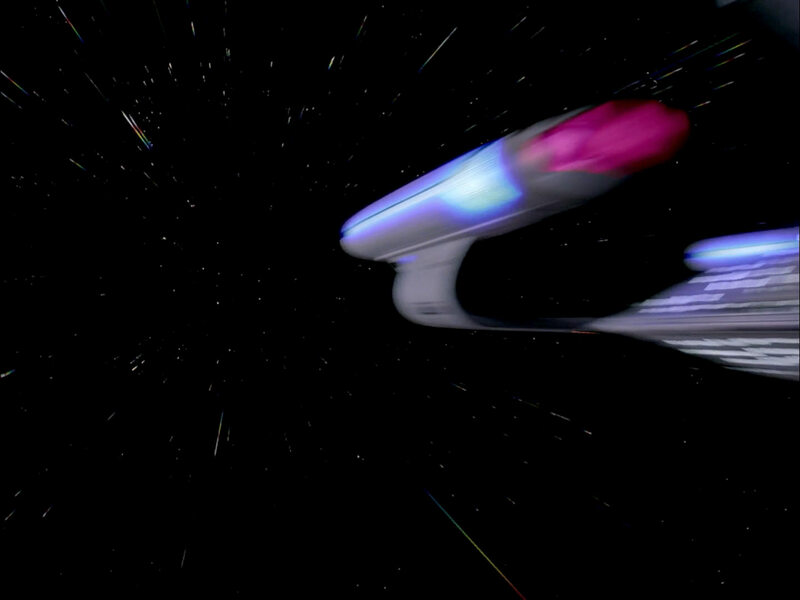 Another shot shows the ship slowing down from warp to impulse speed (2). 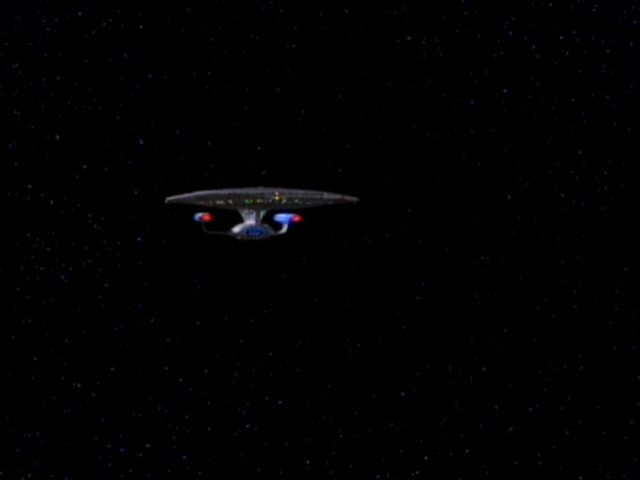 The beginning of this shot is identical to the other two flybys. 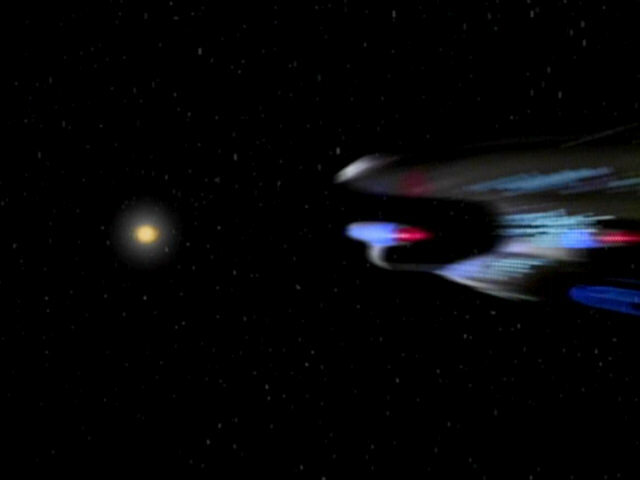 Once the ship has dropped to impulse, though, the model flies much slower past the camera, making the footage appear much less blurred. 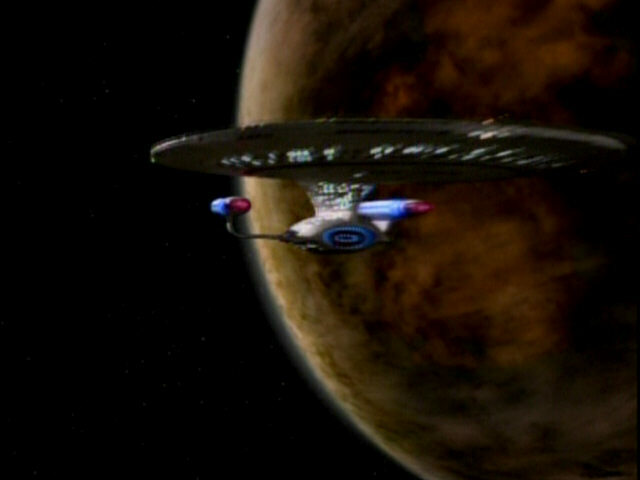 The three versions of this shot were first used in some early season 4 episodes and, from here on, appeared until the end of the series. When work on the remastering of TNG started, the original film of this iconic shot of the USS Enterprise-D could not be located. 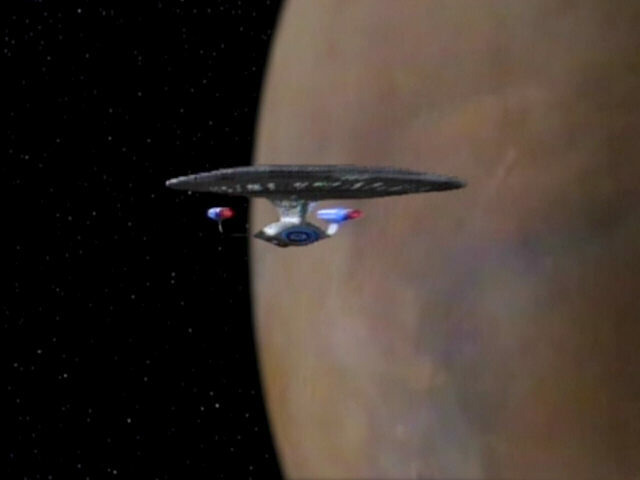 Different other footage and CG models of the ship were used to create replacement footage of this flyby. 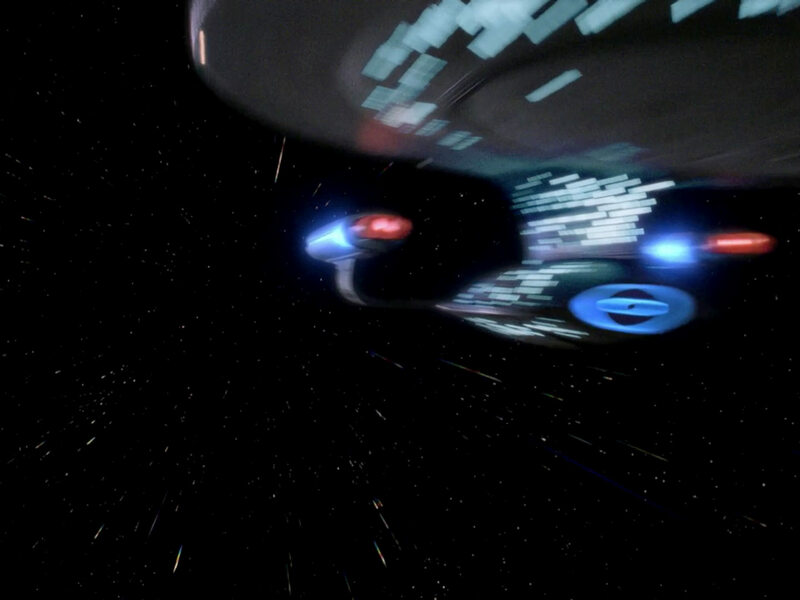 We will refer to the different versions in TNG-R as A to E, in order of their first appearances in episodes (which is not the same order in which the episodes were remastered). 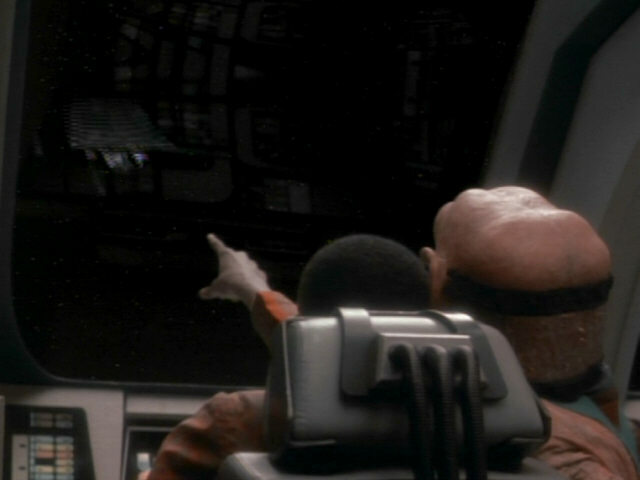 The following article lists all the different versions of the flyby and comments on any other noteworthy changes. 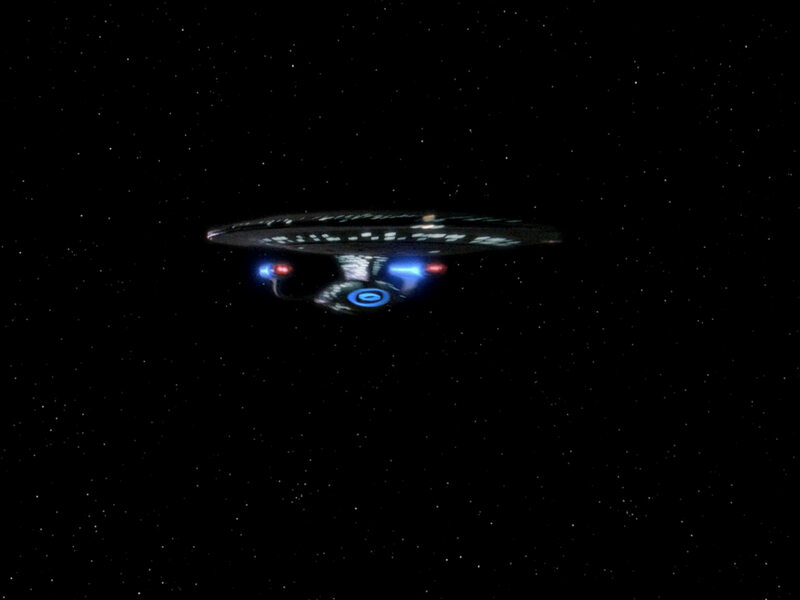 The first time a replacement shot for the missing footage of the Enterprise-D flyby was required was for TNG-R: "The Inner Light". 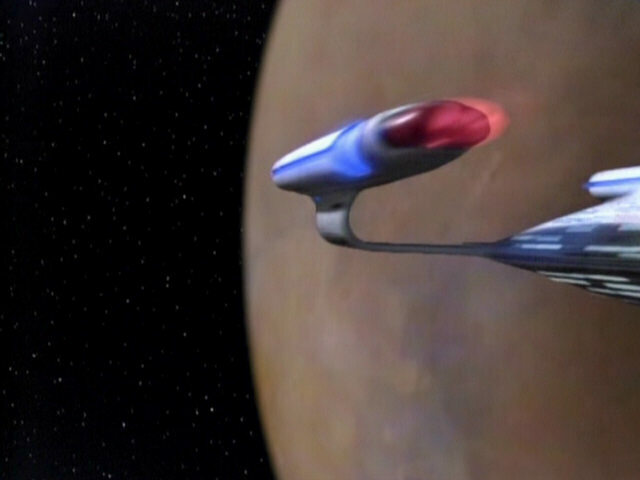 This episode was remastered in advance because it was included on the "The Next Level" sampler Blu-ray disc, together with "Encounter at Farpoint" and "Sins of the Father". 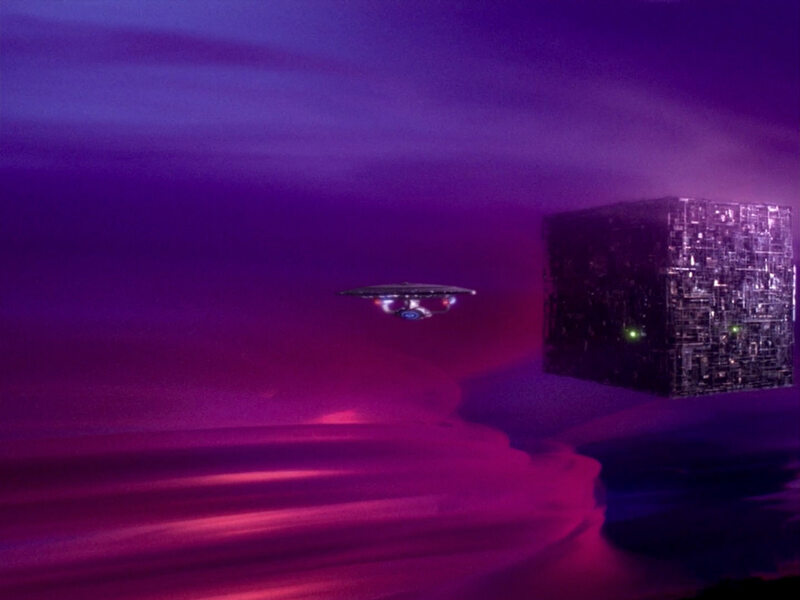 The shot was reconstructed using a CG model by Tobias Richter. 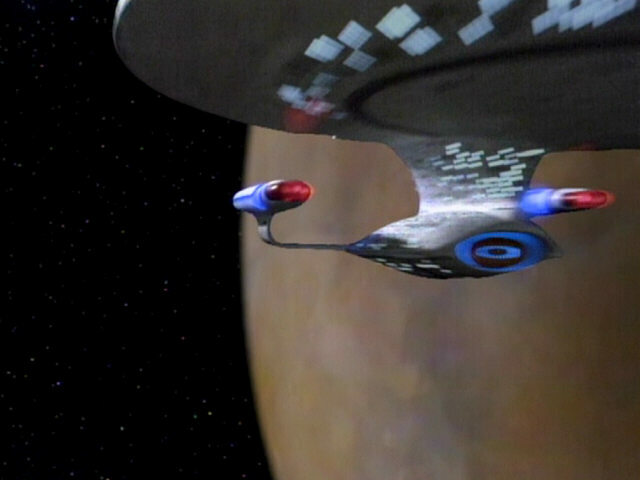 While the original shot showed the newer 4-foot model of the Enterprise (with the thicker saucer rim and the raised panels), Tobias Richter's model is based on the original 6-foot miniature of the Enterprise-D. We refer to this flyby as version E. It only appears in "The Inner Light". 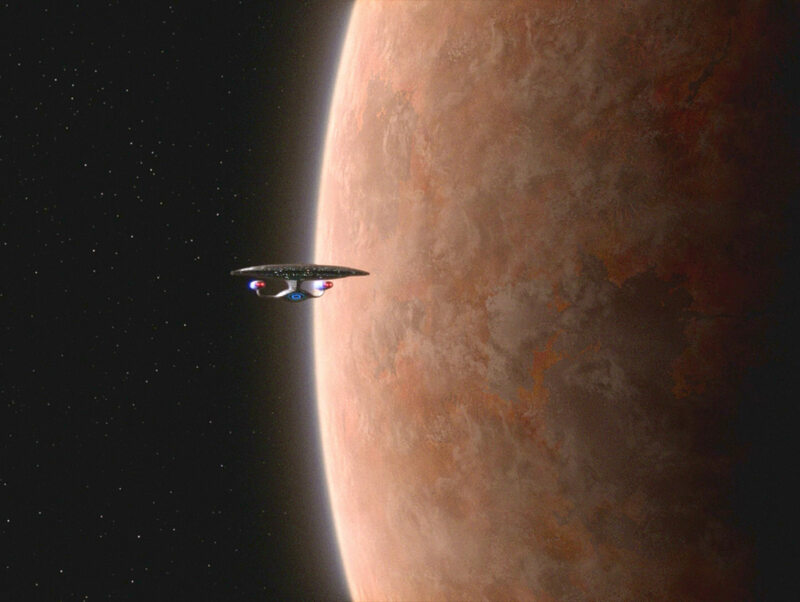 Most of the digital compositing for season 4 was outsourced to the company Modern VideoFilm, while CBS-D took care of just two episodes, "The Best of Both Worlds II" and "Redemption I", to ensure visual consistency with their other parts, in season 3 and season 5, respectively. In the aforementioned two episodes, as well as in a couple of season 5 episodes, we can see the flyby using footage of the physical 4-foot model of the Enterprise. 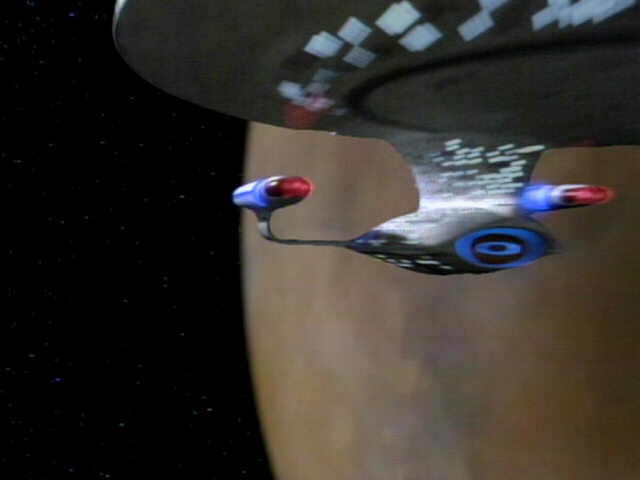 It turns out that a similar shot of the same model originally from TNG: "Relics" was used, in which the Enterprise is flying in opposite direction, and that this shot was mirror-inverted. 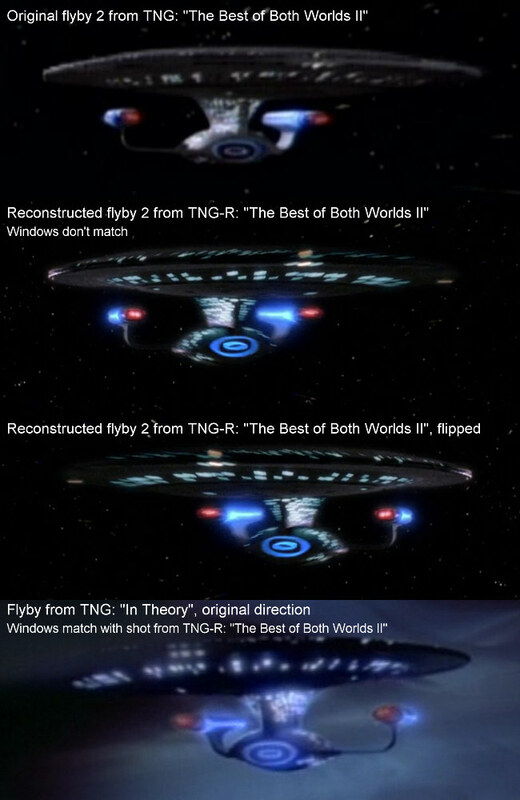 This is evidenced by the same window lighting, comparing the shot from "The Best of Both Worlds II" with one showing the model in its original orientation, such as the one from "Relics" or a similar one with the same lighting pattern from "In Theory". 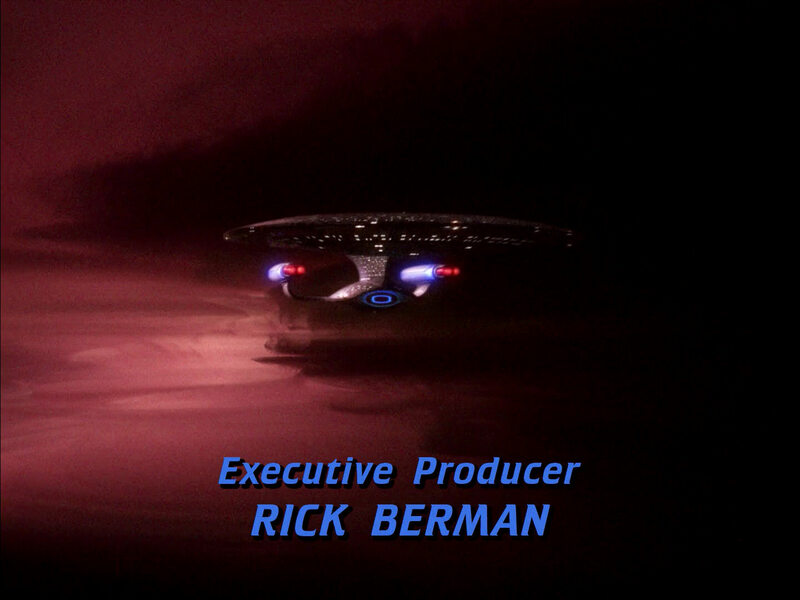 Origin of the A/B footage in TNG: "Relics"
The original shot from "Relics" appears to be blurred towards the end. 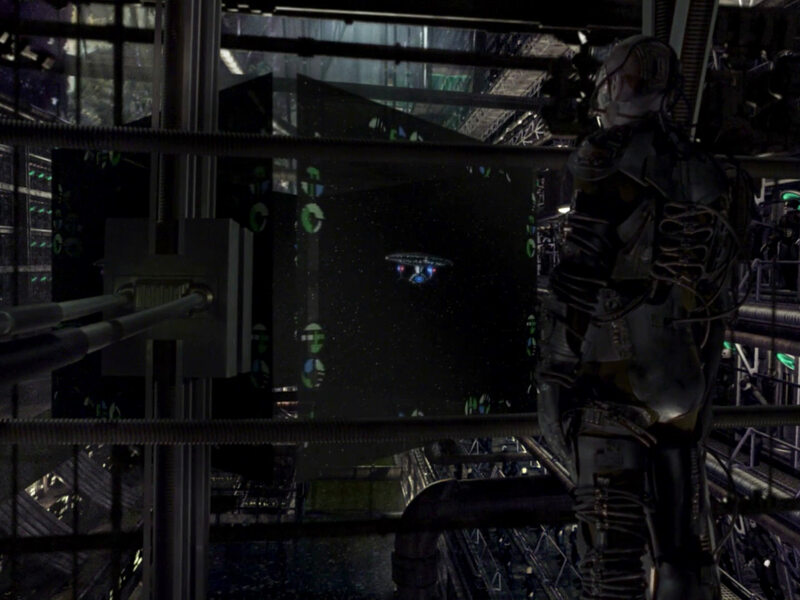 This can be seen as a beneficial side effect, as it obscures the ship's registry on the warp pylon in the mirrored stand-in shot. 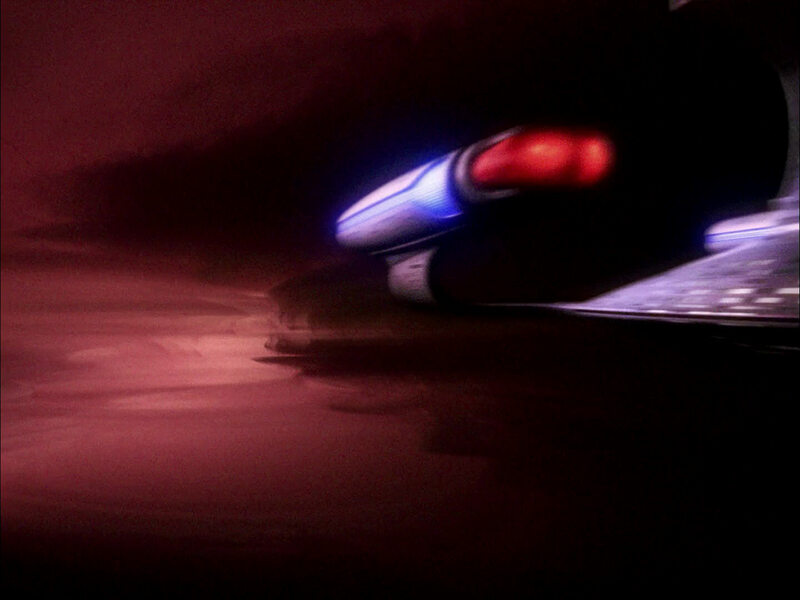 Motion blur is considered to be a virtue anyway in most cases because it looks more natural than stop motion, for instance (even CG shots are rendered with blurring for that matter). 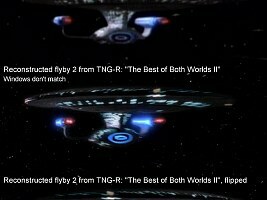 We refer to the mirrored shot as version A (for the one created by CBS-D) or B (for the one by Modern VideoFilm, with slightly lower quality). 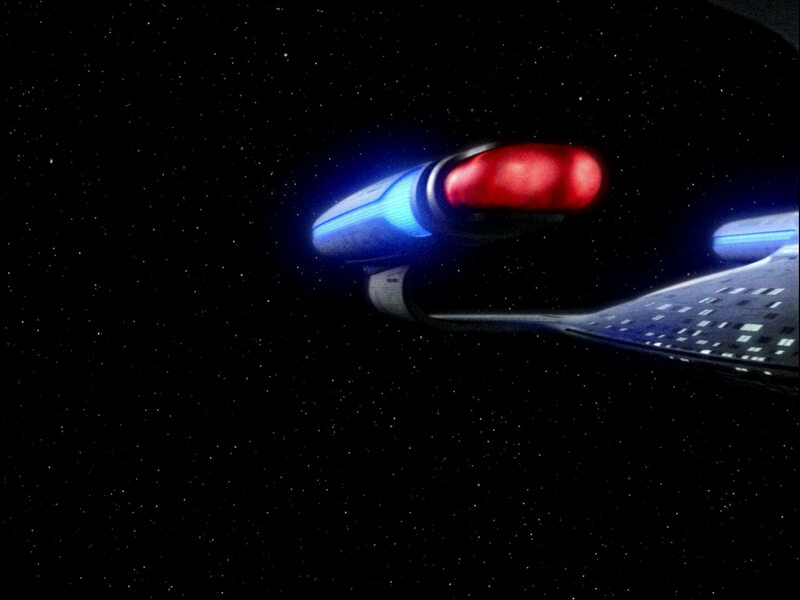 At one point in the fourth season, a CG model was required, rather than the rather blurry flipped shot of the ship. 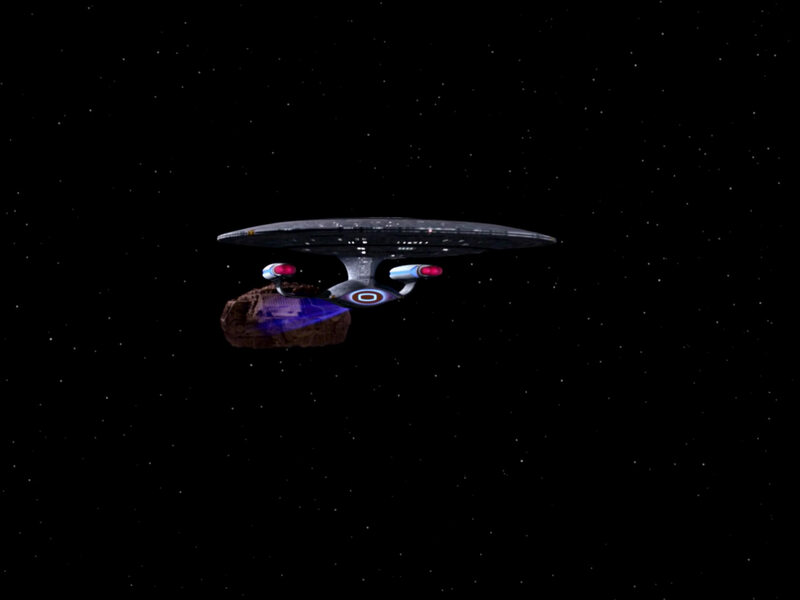 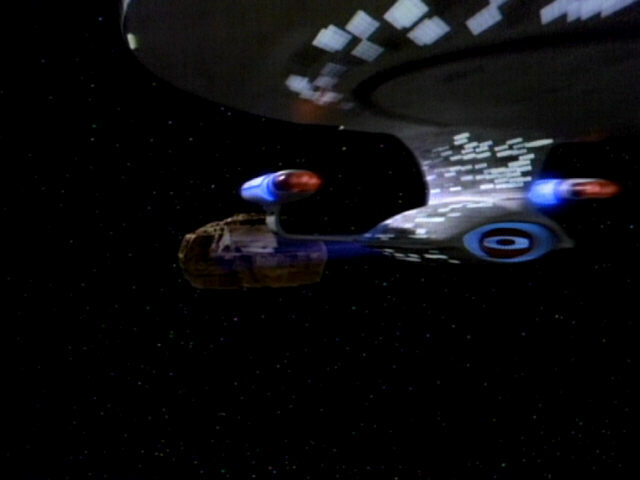 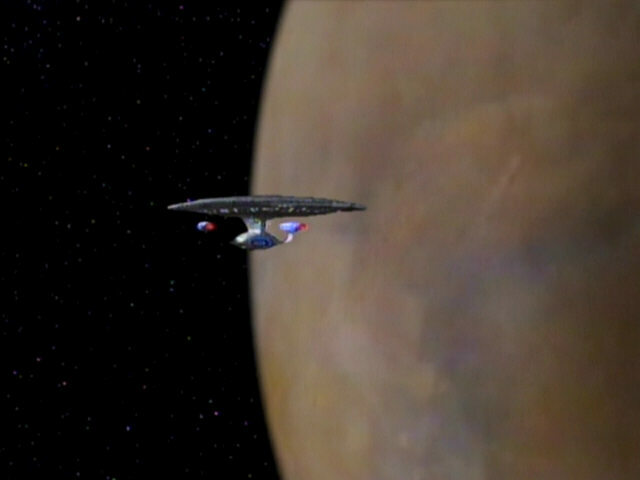 The episode was "Final Mission", where the Enterprise is towing the alien freighter. 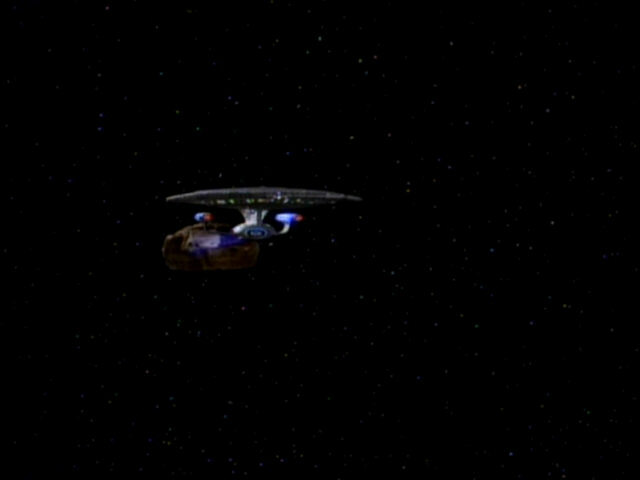 The darker tone and deeper shadows of the other ship's shots would not have worked so well for this particular shot. 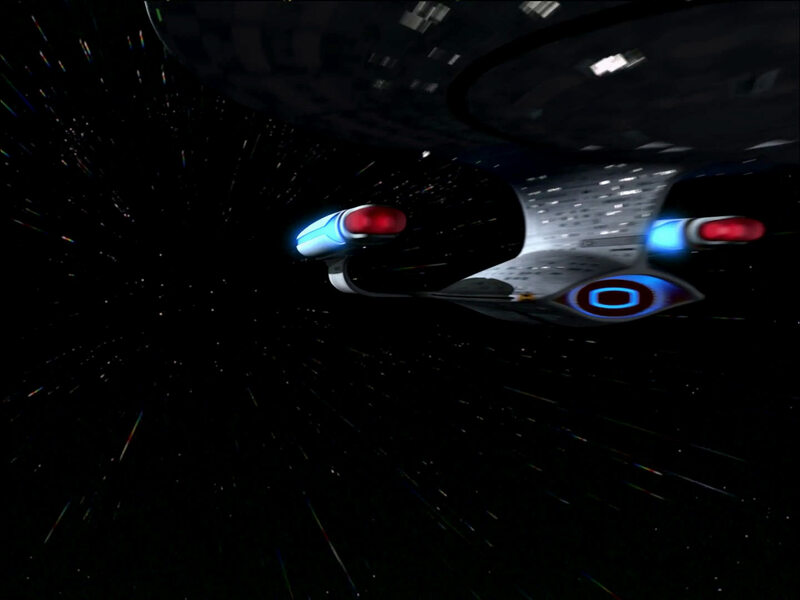 While Modern VideoFilm was in charge of the episode, CBS-D did the actual rendering (including lighting and motion blur) of the already existing model by Tobias Richer (E). 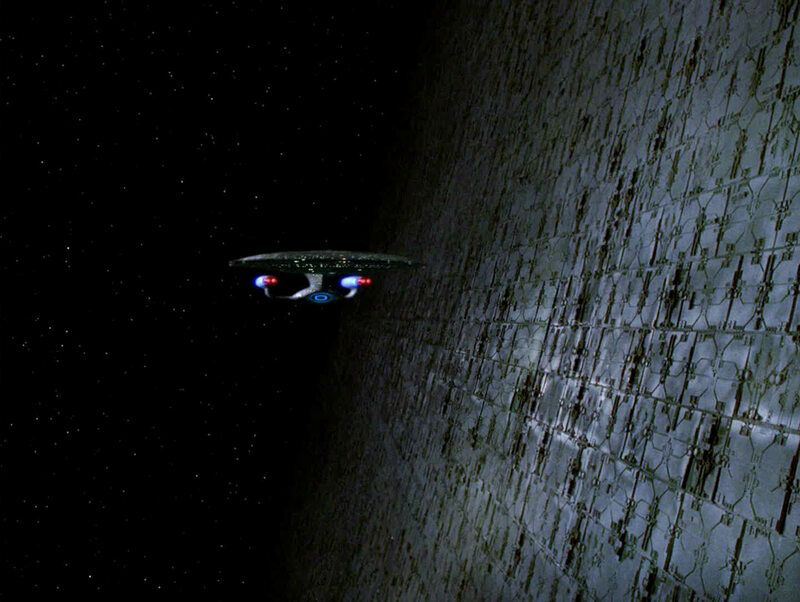 This is what we refer to as version C of the flyby. 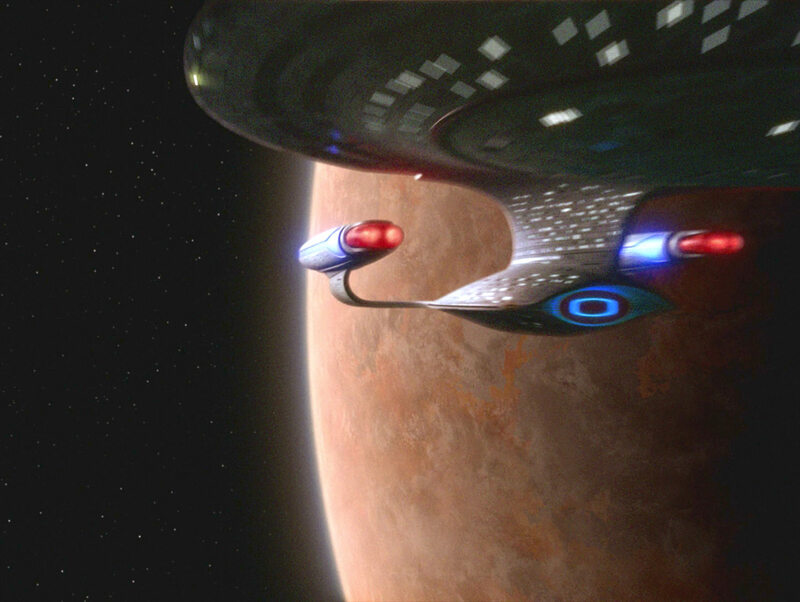 Eventually, a new and more detailed CG model was created on behalf of CBS-D, which is still based on the 6-foot Enterprise, just as the original one by Tobias Richter (E), but which also incorporates a slight paneling as on the 4-foot model. 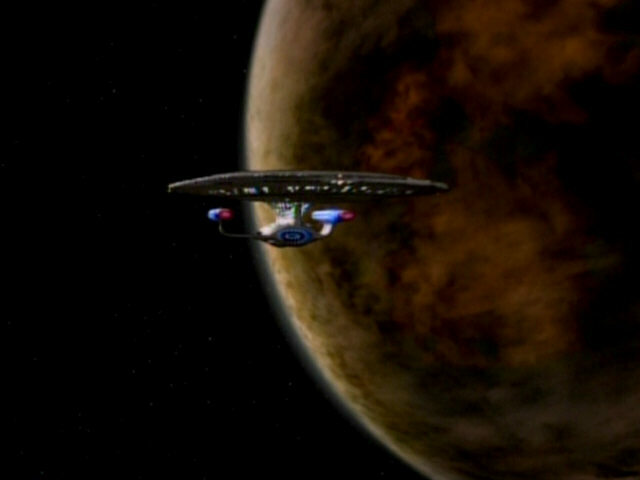 This model appears in all episodes since the fifth season that include any of the original three shots. 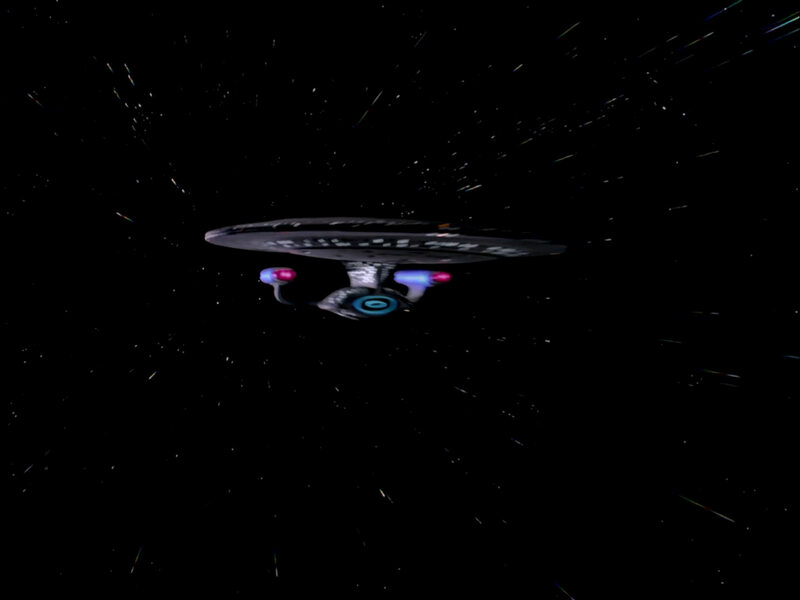 We refer to this shots using this model as version D. It is the arguably best model so far. 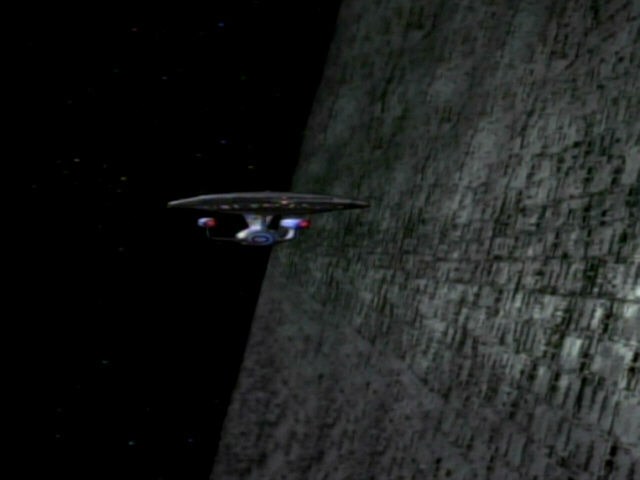 "The Best of Both Worlds II"
The warp flyby (1) appears for the first time in this episode. 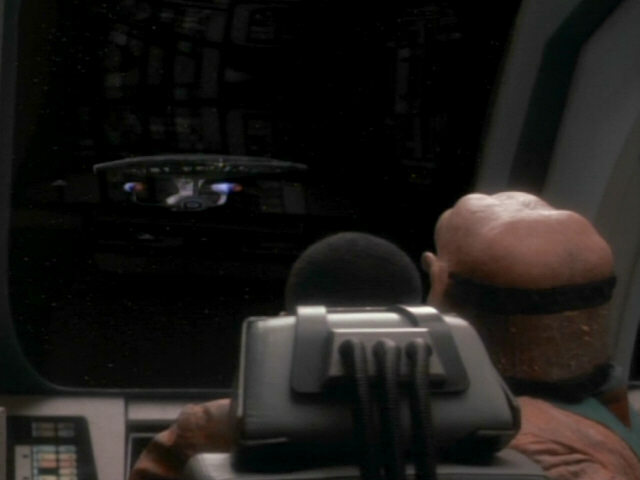 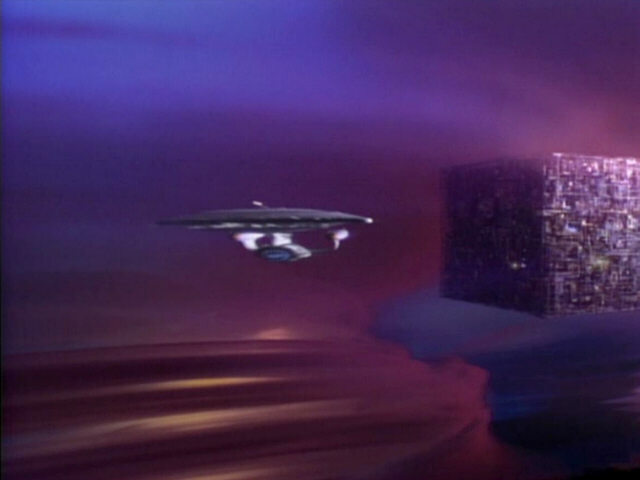 The impulse flyby (3) is seen on a Borg monitor inside the Borg cube. 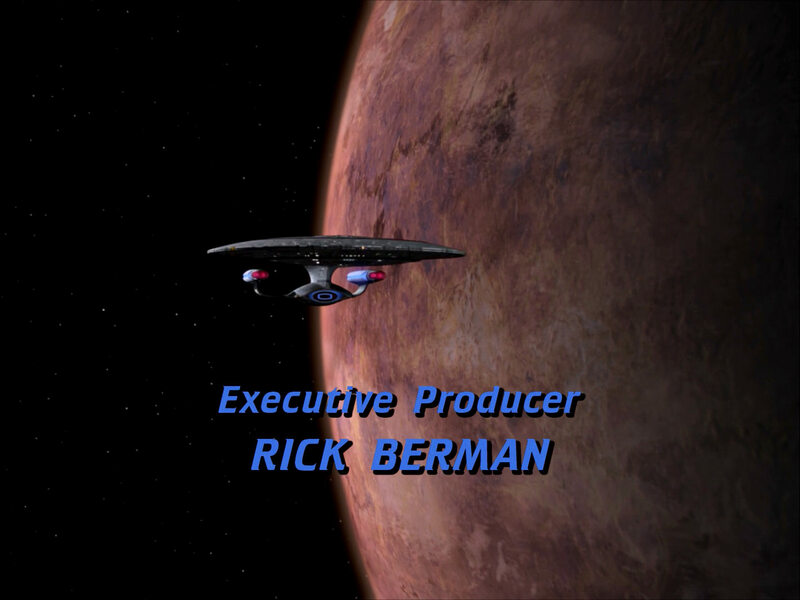 Even though season 4 was remastered by Modern VideoFilm, CBS-Digital oversaw the remastering of "The Best of Both Worlds II" and "Redemption I" for consistency’s sake, as seasons 3 and 5 were remastered by CBS-Digital, too. 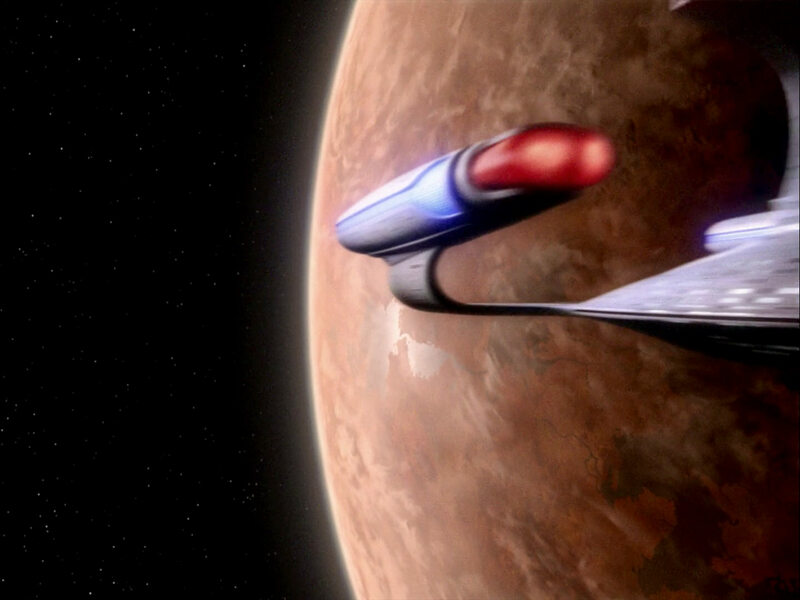 CBS-Digital created a replacement of this shot for of "The Best of Both Worlds II" (A), by flipping existing footage of a very similar flyby of the 4-foot model that was originally filmed for "Relics". 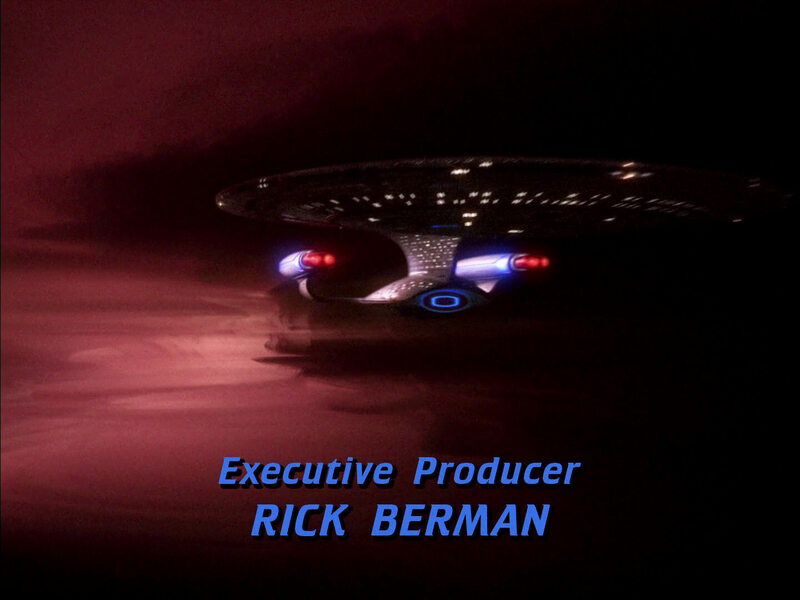 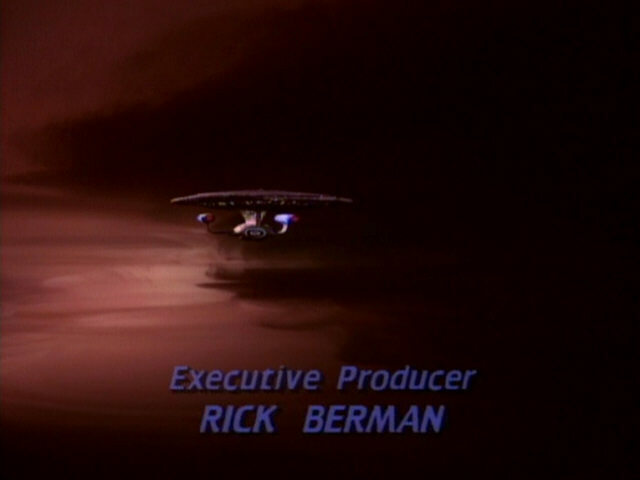 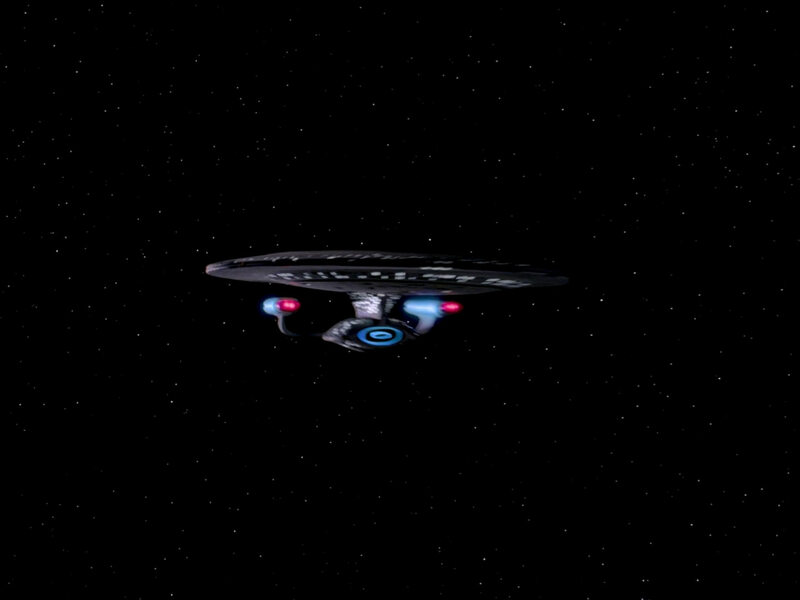 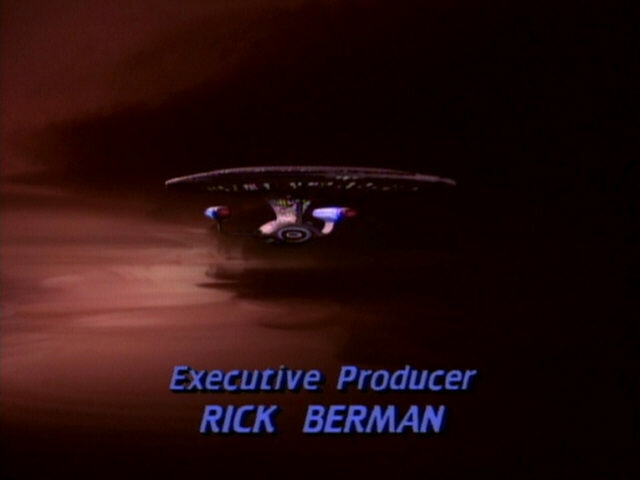 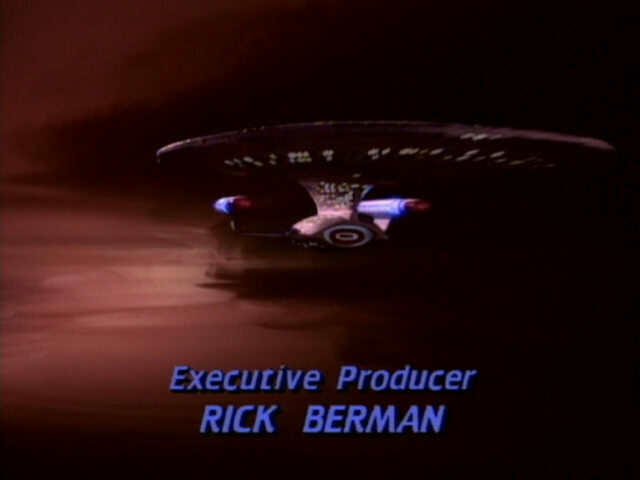 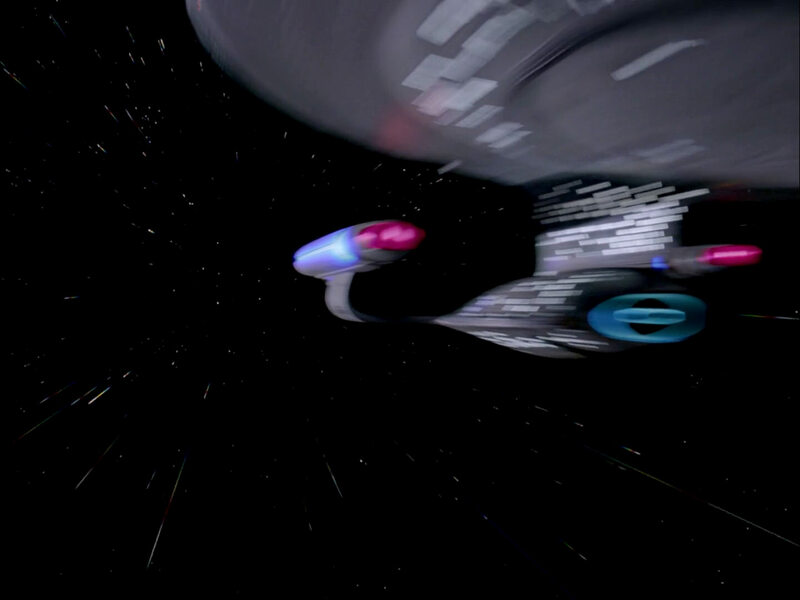 This shot, which will appear again in season 5, gets very blurry, the closer the Enterprise-D comes to the camera. 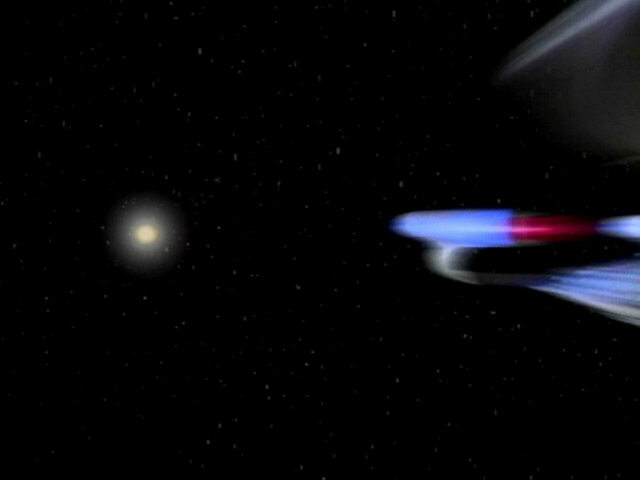 No warp drop flyby exists with this footage. 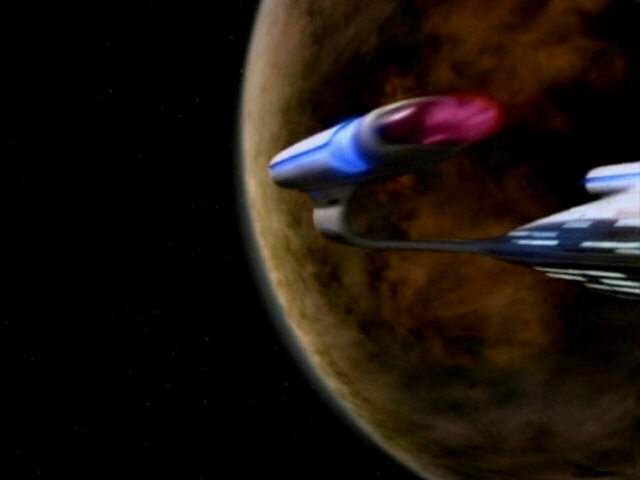 "Brothers" and "Legacy", like almost all of season 4, were remastered by Modern VideoFilm. The company used the same mirror-inverted shot (B) of the 4-foot Enterprise-D as CBS-Digital (A). 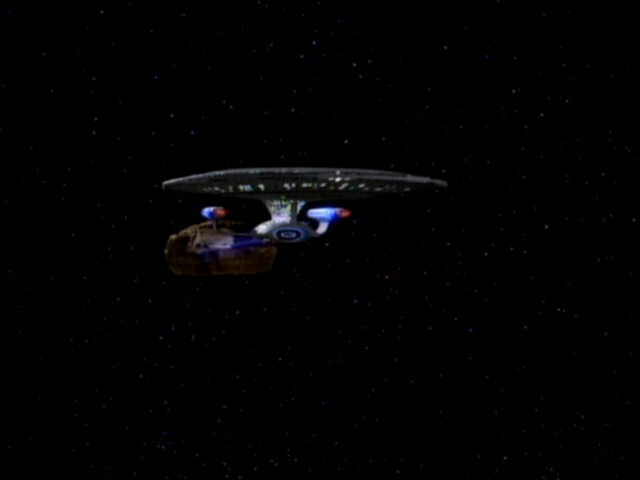 The ship is lit differently, though, and the footage seems slightly warped. 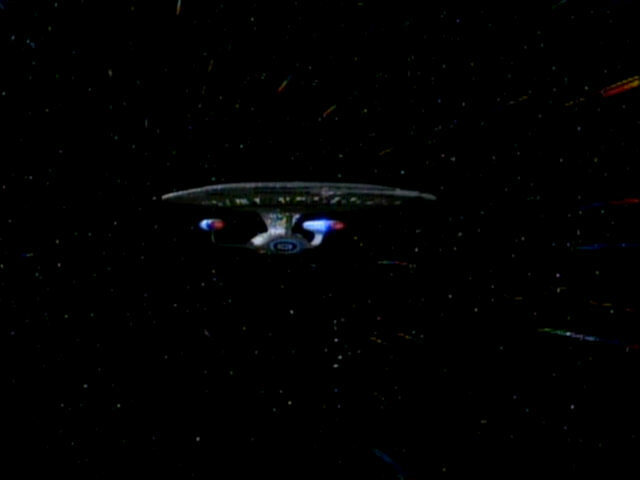 Only the warp shot appears in these episodes. 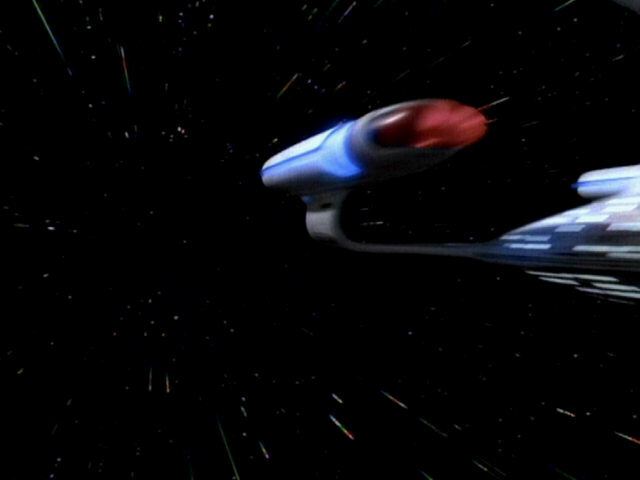 The B-version of the warp flyby (1) is seen again in the remastered version of this episode. 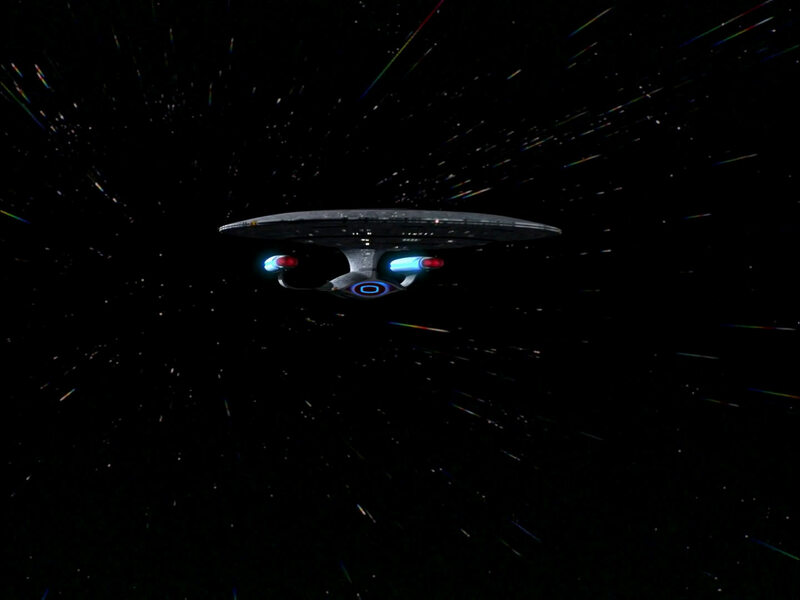 The CG model by Tobias Richter debuts in the remastered episode for the impulse shot (3C). 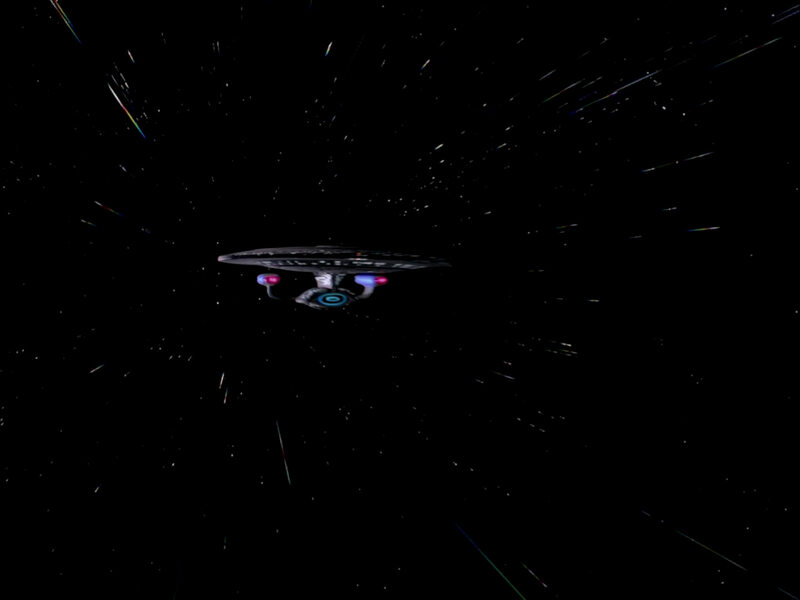 The model is somewhat blurry compared to its appearance in "The Inner Light" (remastered in advance for the sampler disc). 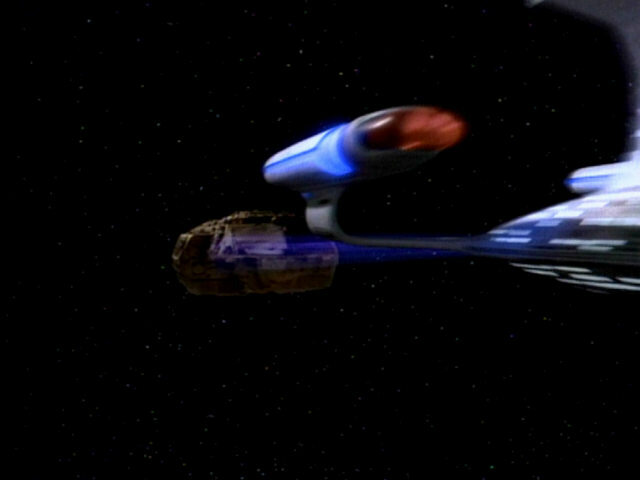 In "Final Mission", the ship is seen pulling the garbage freighter with a tractor beam at impulse. 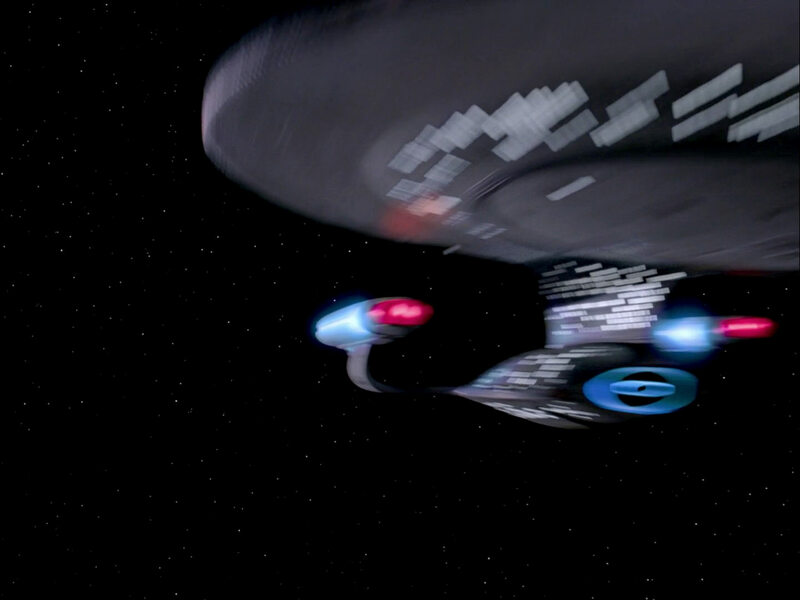 As the ship slowly flies past the camera and this is more than just a regular flyby with a captain’s log, the CG model (C), rather than the footage of the 4-foot miniature (A & B), was needed. 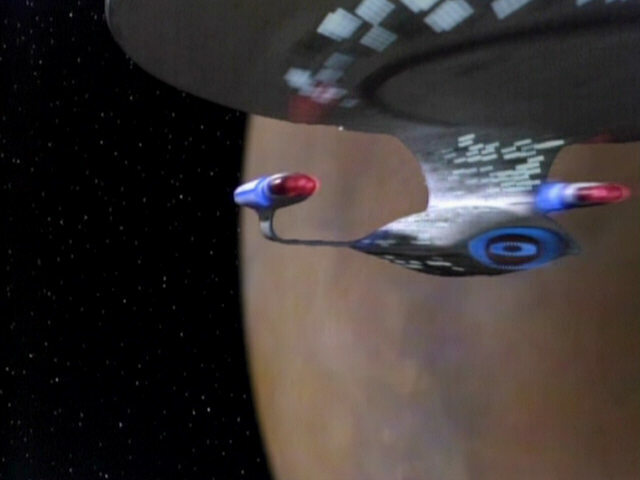 The drop to impulse shot (2) appears for the first time in the episode. 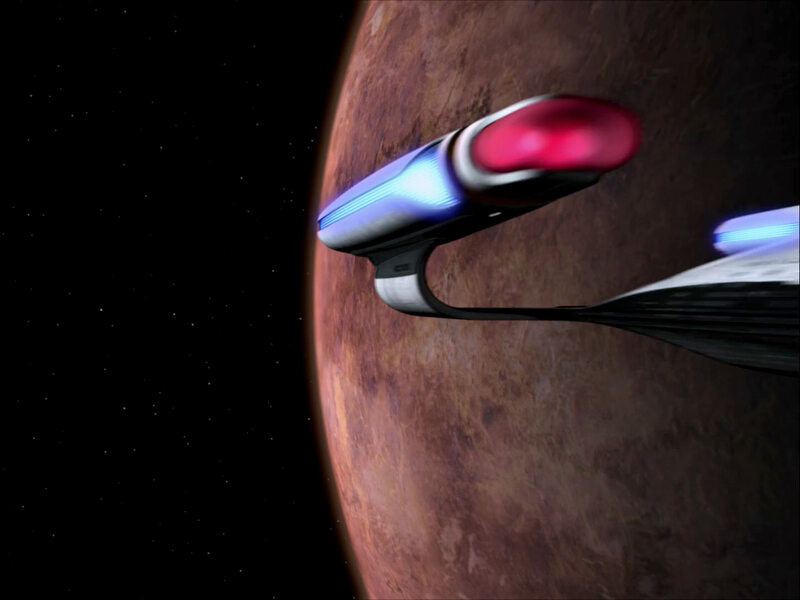 The CG model by Tobias Richter is used by Modern VideoFilm for this shot in the remastered version of the episode (C). 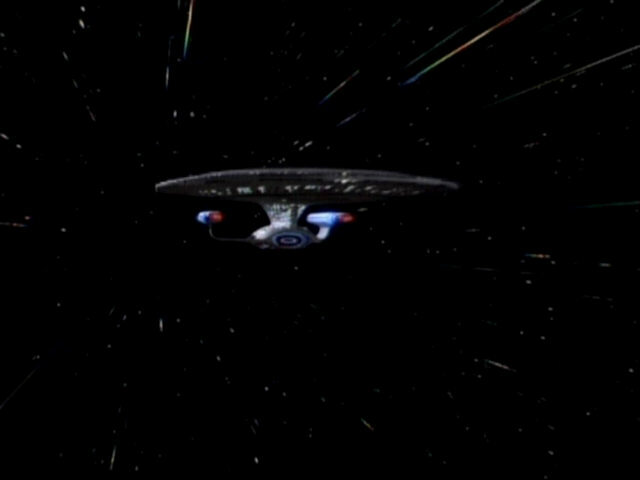 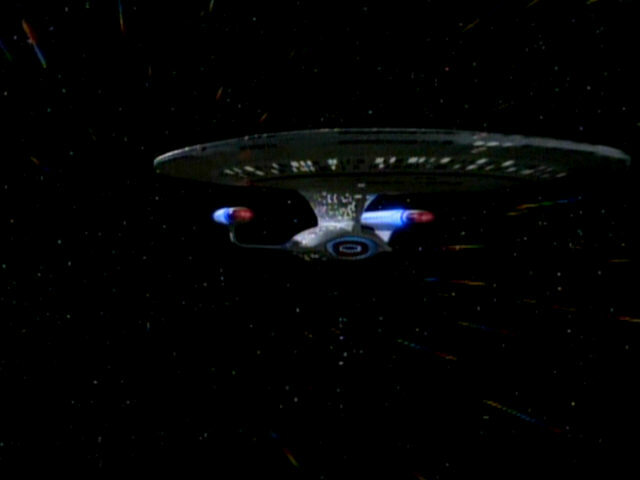 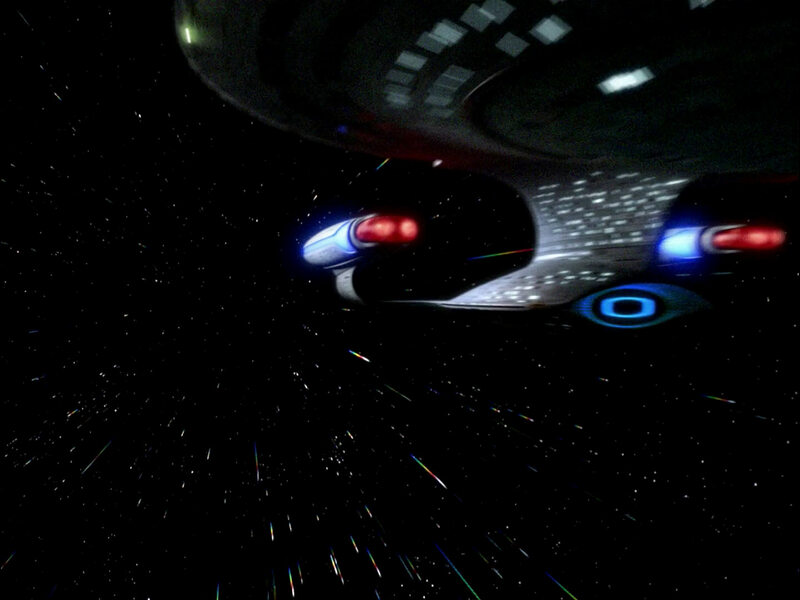 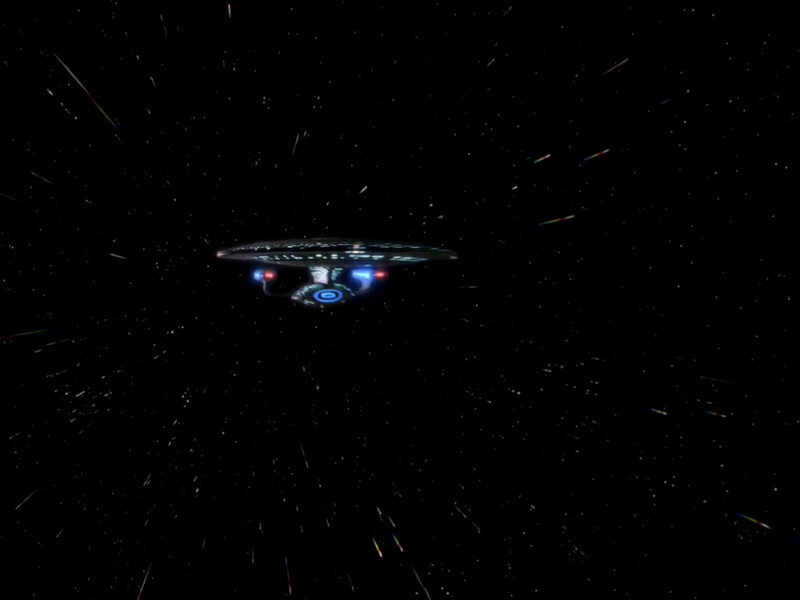 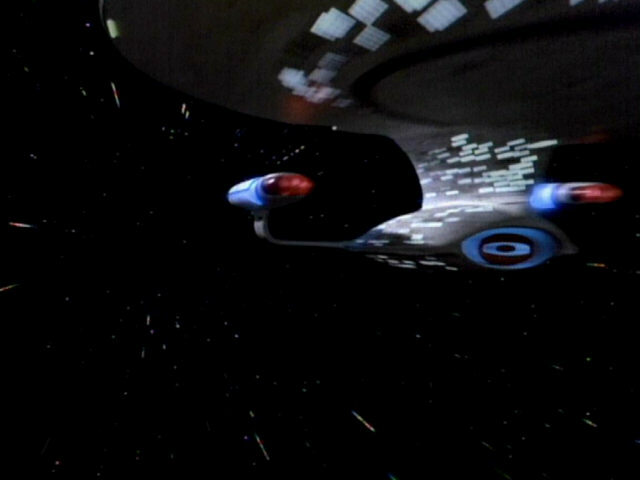 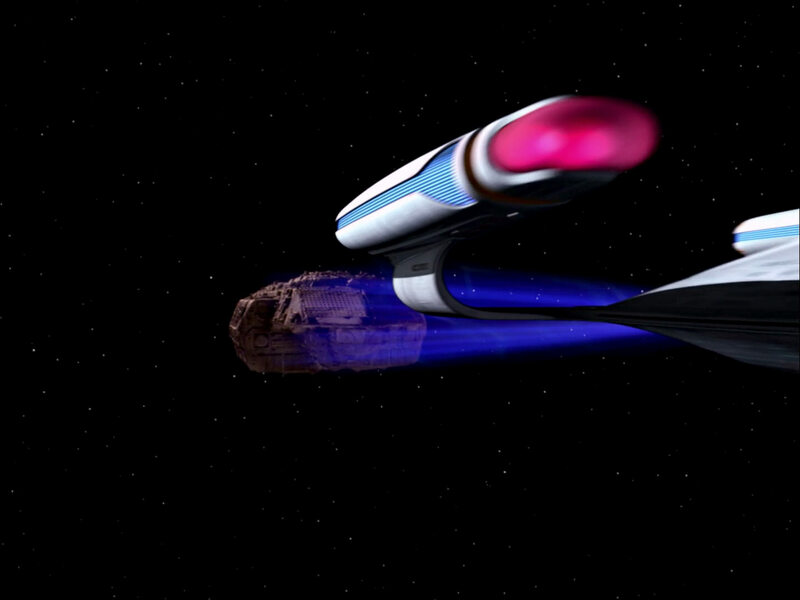 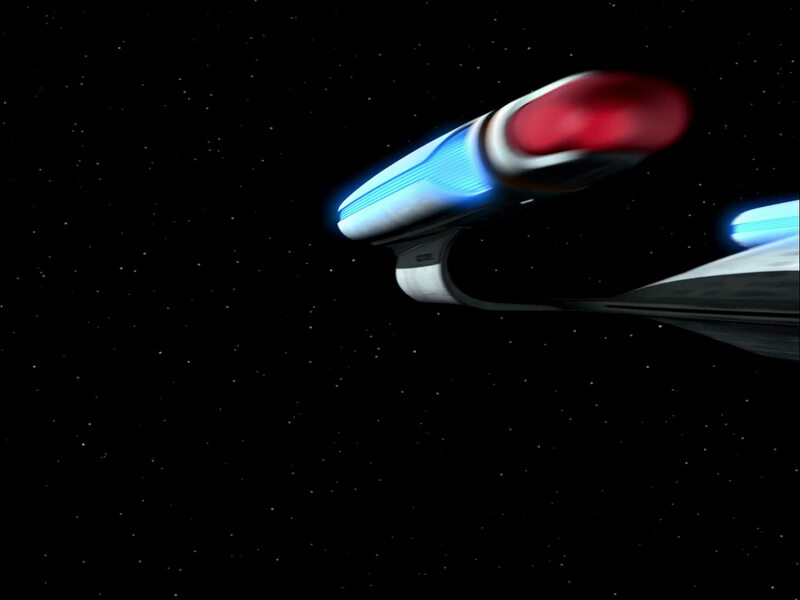 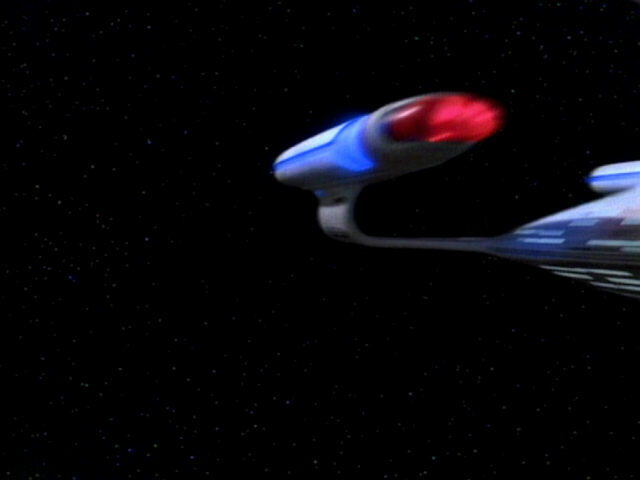 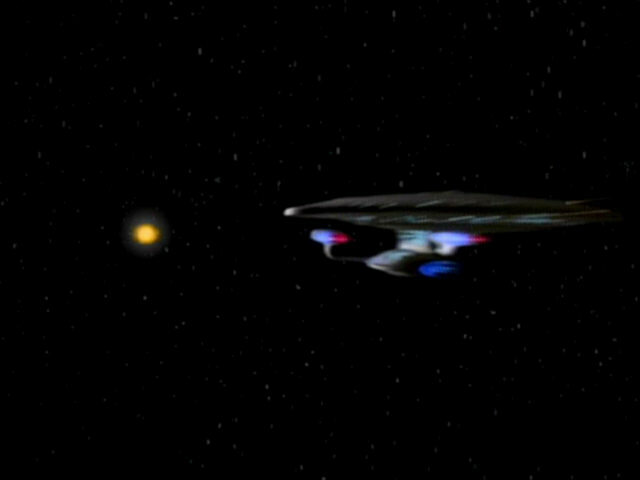 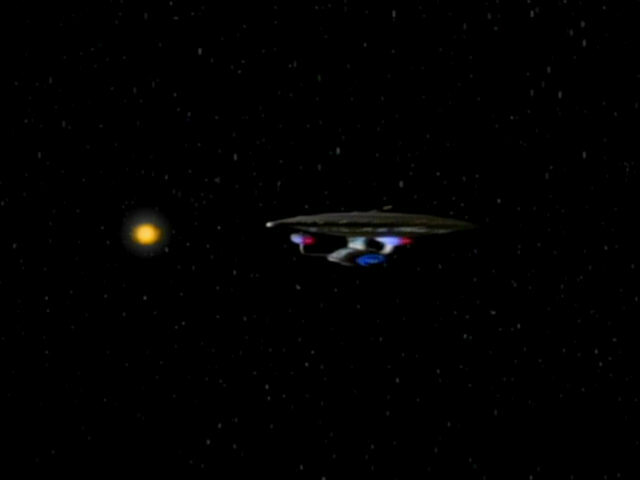 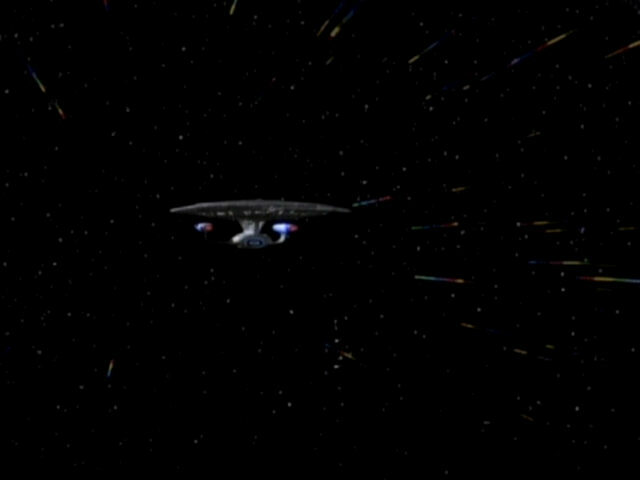 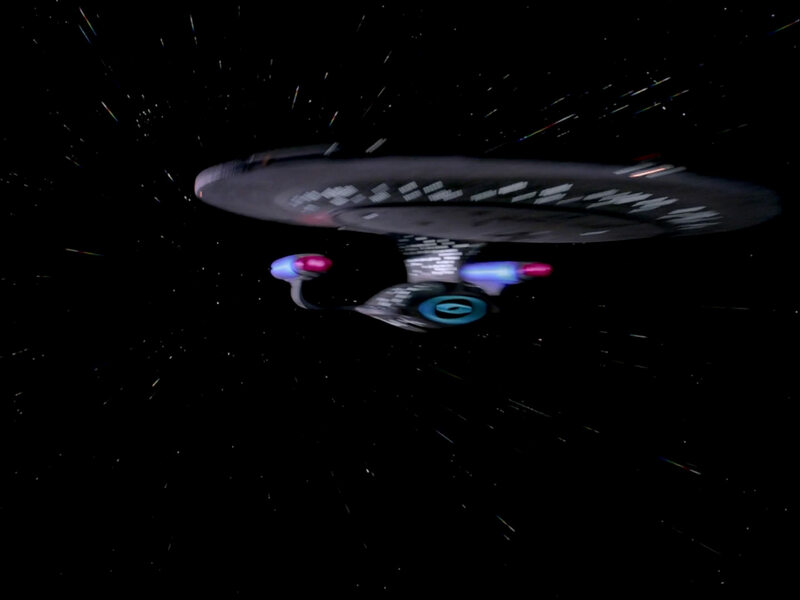 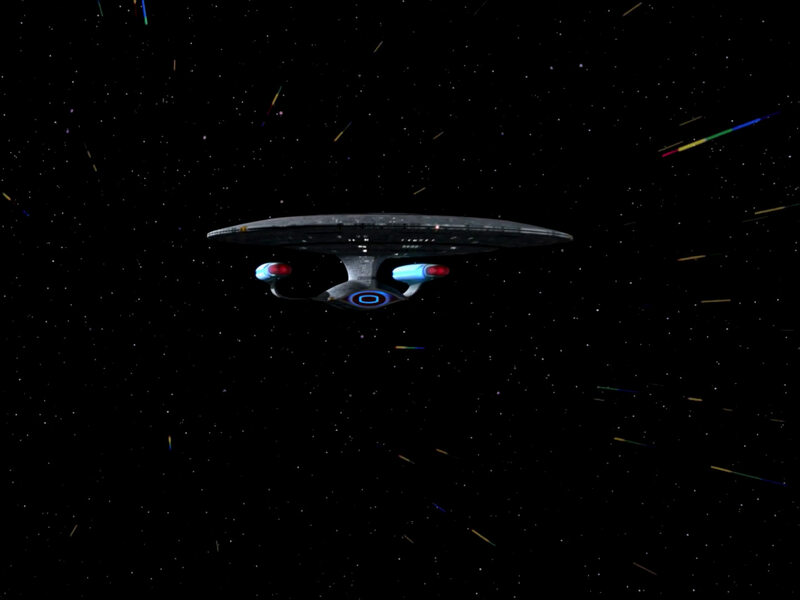 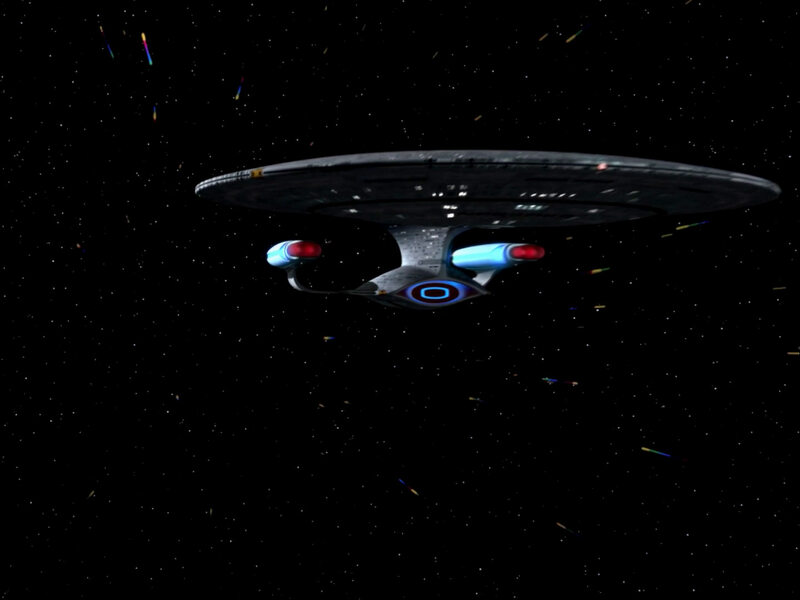 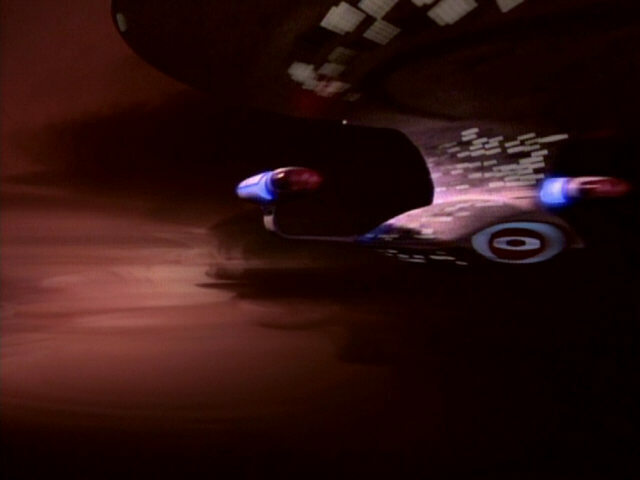 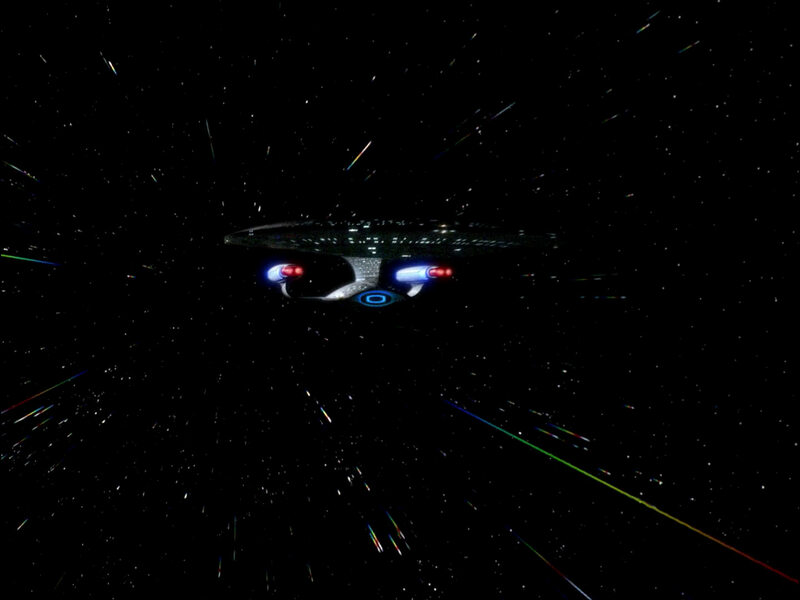 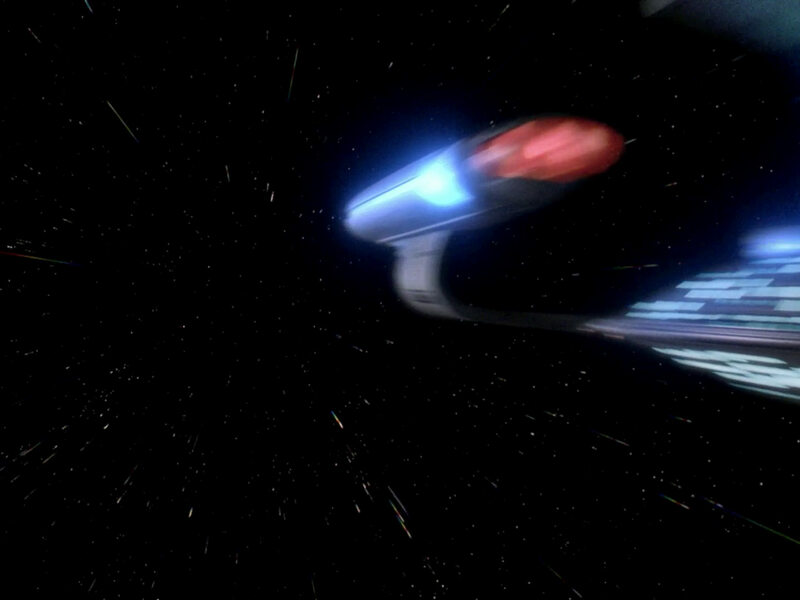 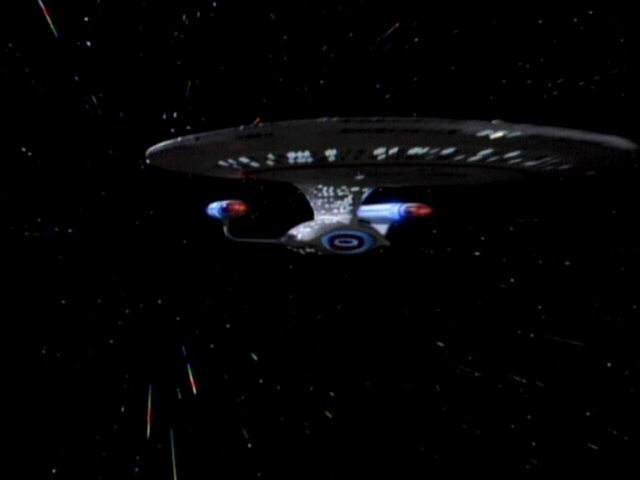 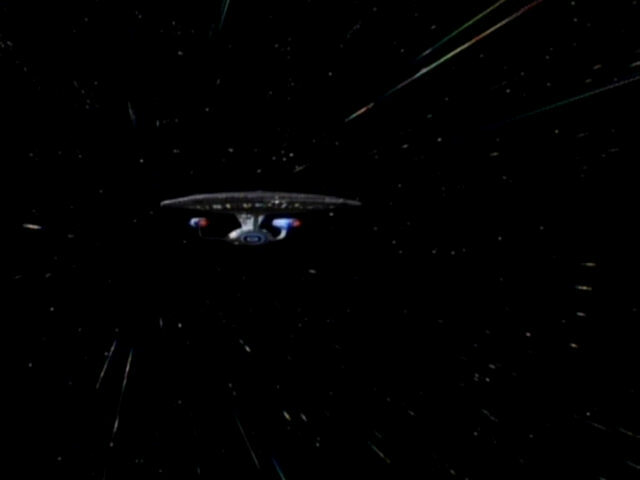 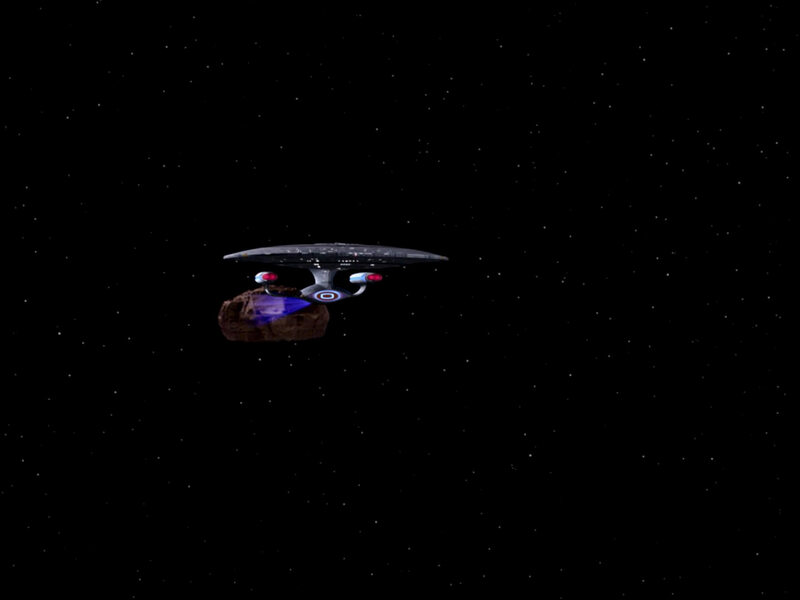 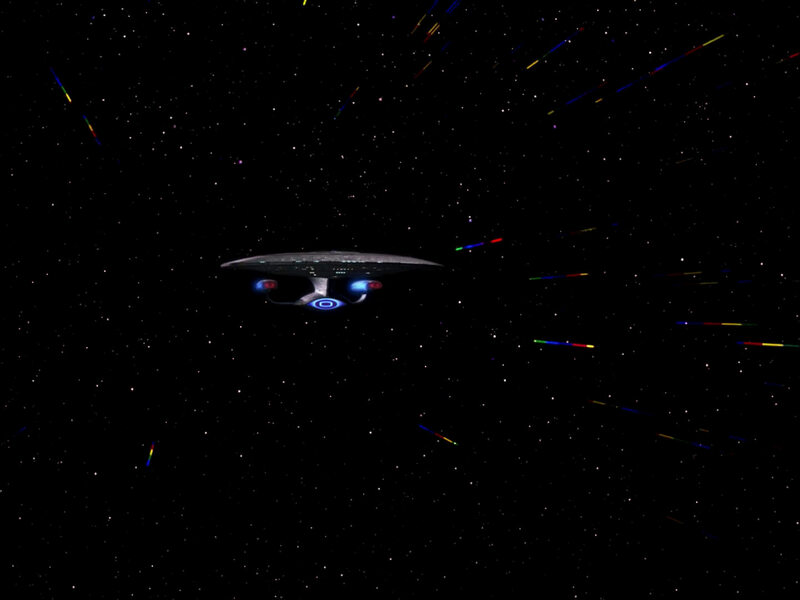 In contrast to later season 4 episodes, in which the warp drop is seen, and also unlike the original version of this shot, the ship slows down to impulse much earlier in the remastered version of only this episode. 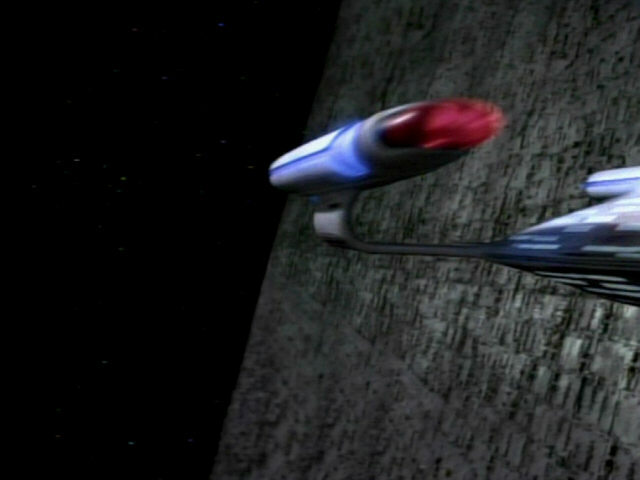 After the new version of the impulse shot (3) had been introduced in "Final Mission", using model C, the blurry version of the physical model (B) appears one last time in this episode. 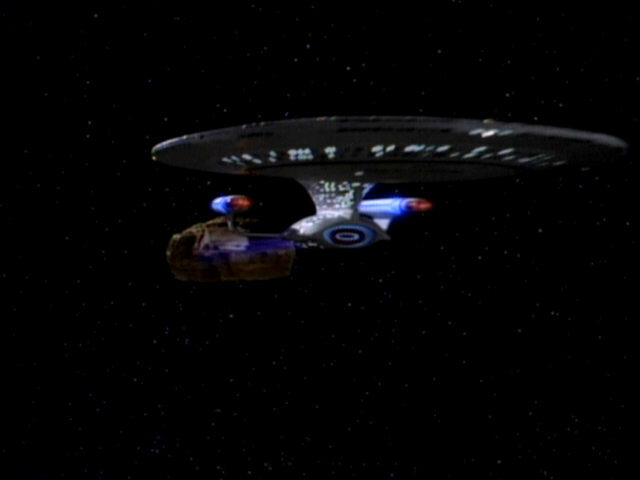 It looks different than model B in other episodes, because the ship was inserted lower into the frame here. "Identity Crisis" Model like in "Data's Day"
The season 4 CG flybys (C), both the warp (1) and impulse (3) versions, are seen in this episode. The impulse flyby shows the ship leaving orbit of Tarchannen III. 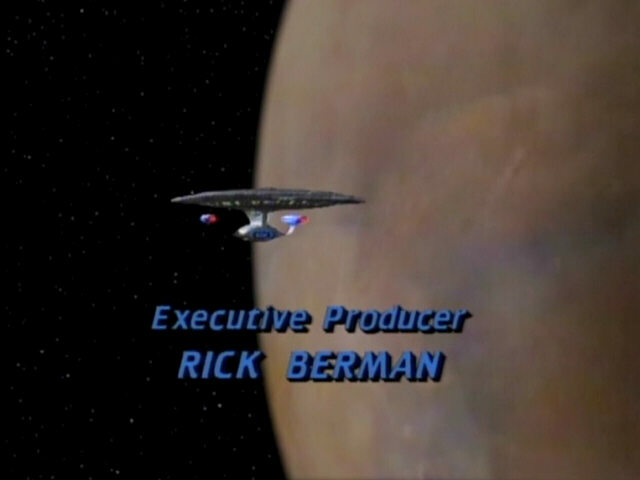 The planet had to be recreated for the remastering as well. 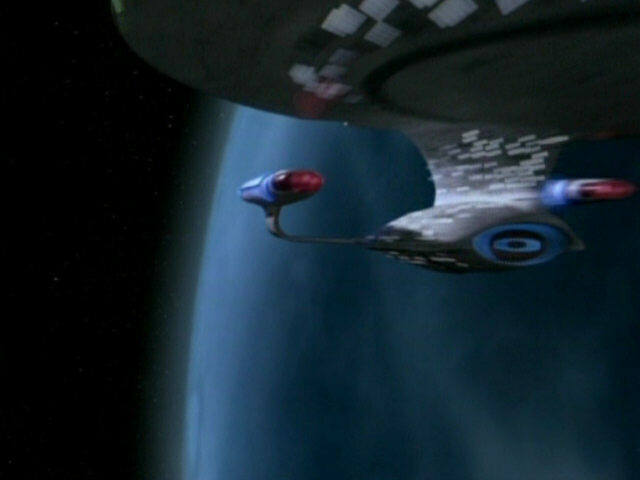 The original SD footage of ship and planet was later re-used in the original version of "Ethics". 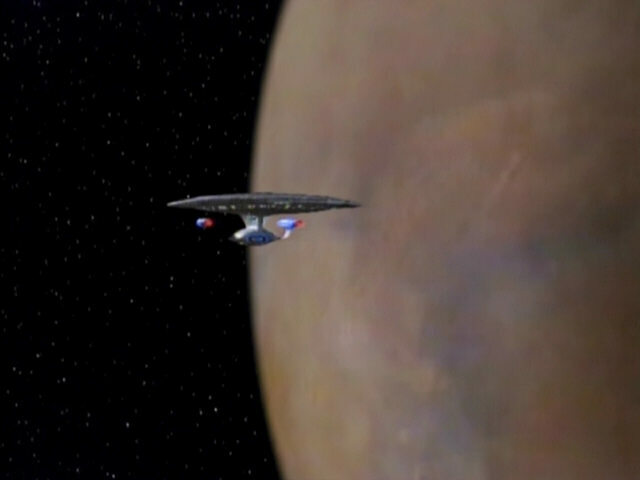 When that episode was remastered, a new planet was created (and a new version of the flyby, using a different, more elaborate CG model was used). 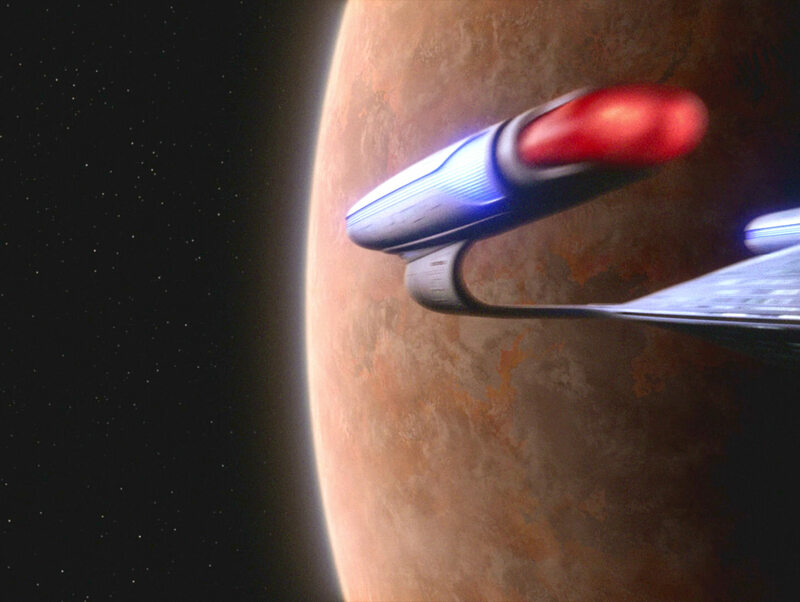 The C-version of the impulse flyby (3) is seen in the remastered episode. 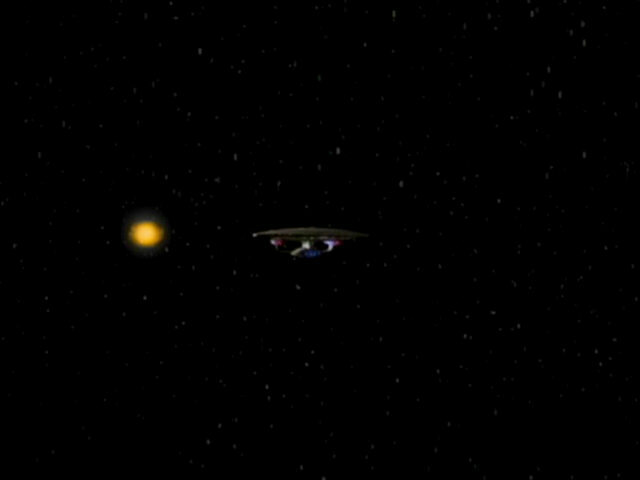 In the original SD version of "Half a Life" we can see a flyby from the left to right of the screen, as the Enterprise-D runs from the supernova. 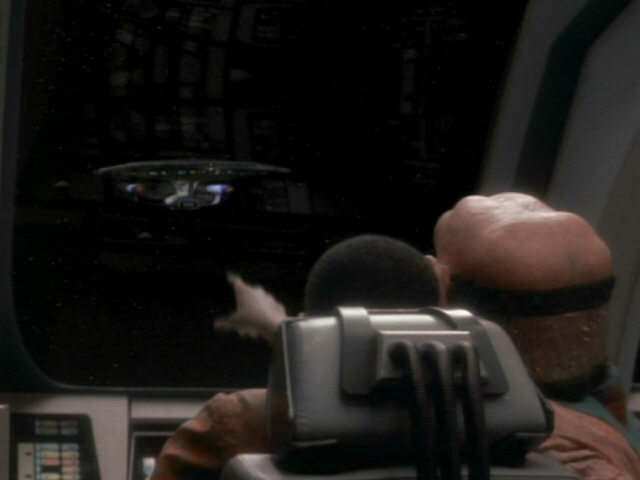 It looks similar to the shot that is the subject of this page but is not the same. 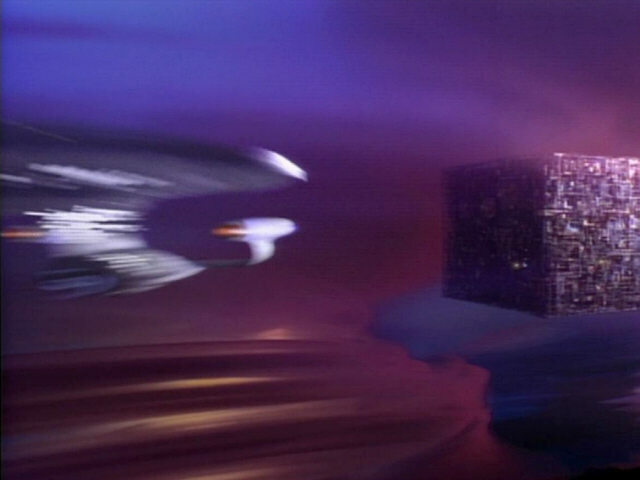 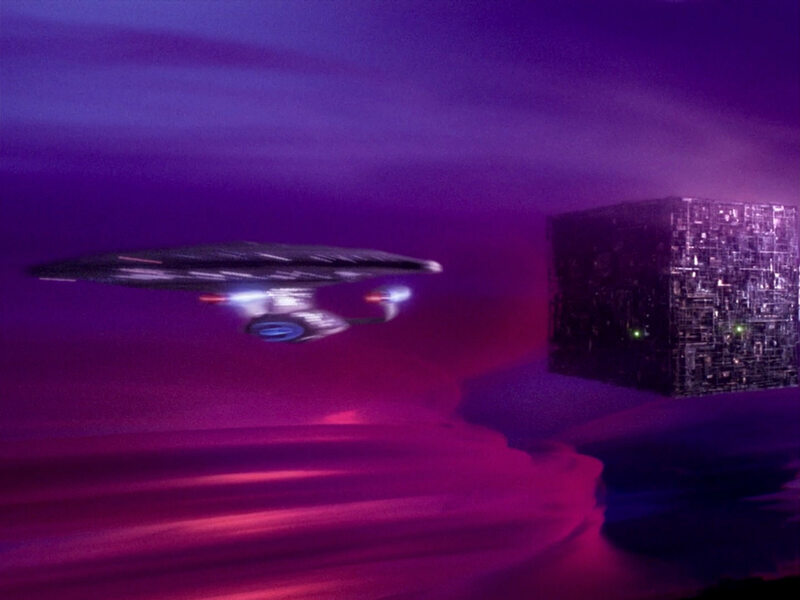 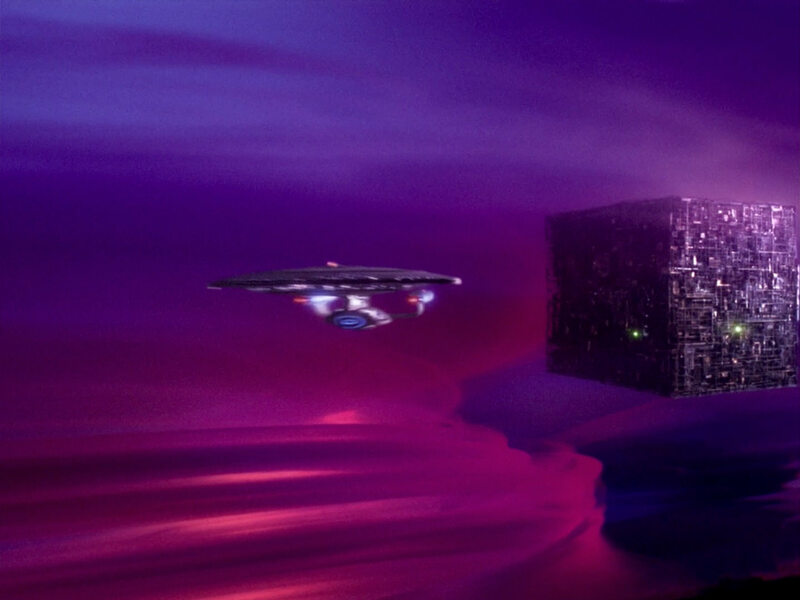 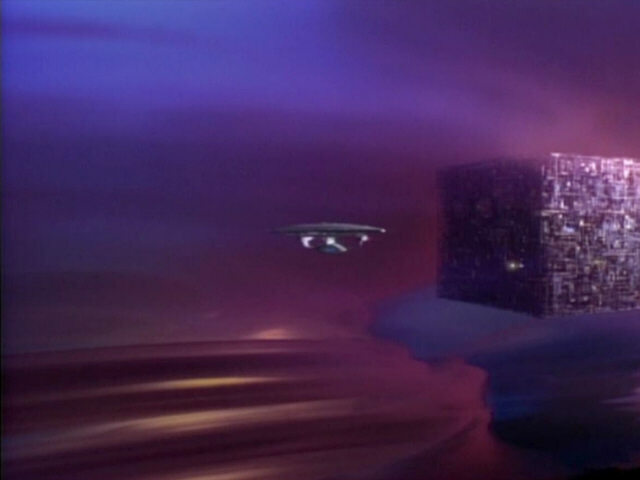 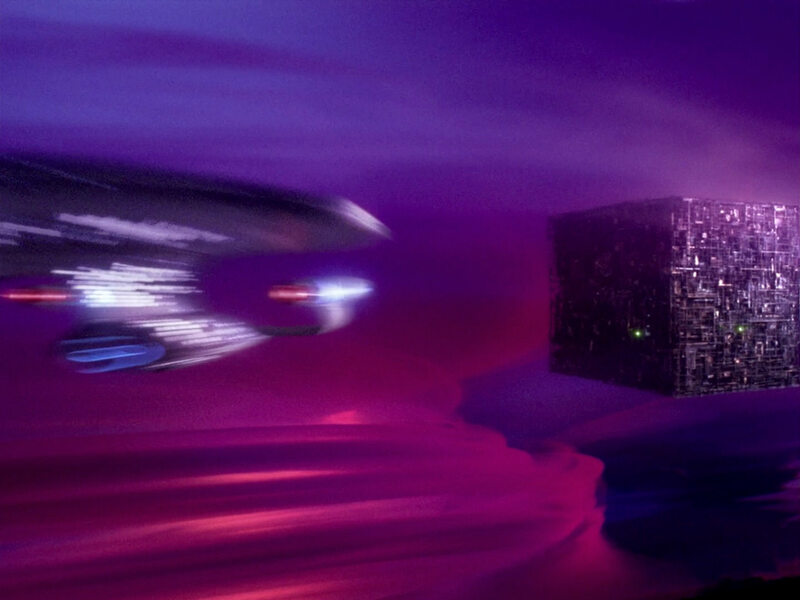 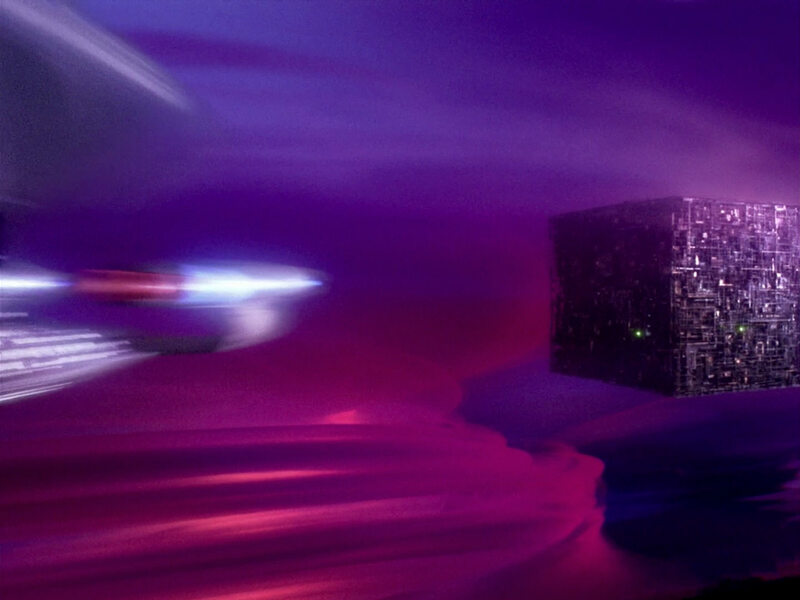 Actually, the shot in the SD version of "Half a Life" previously appeared in "The Best of Both Worlds I", where the Enterprise flies past the Borg cube in the Paulson Nebula. 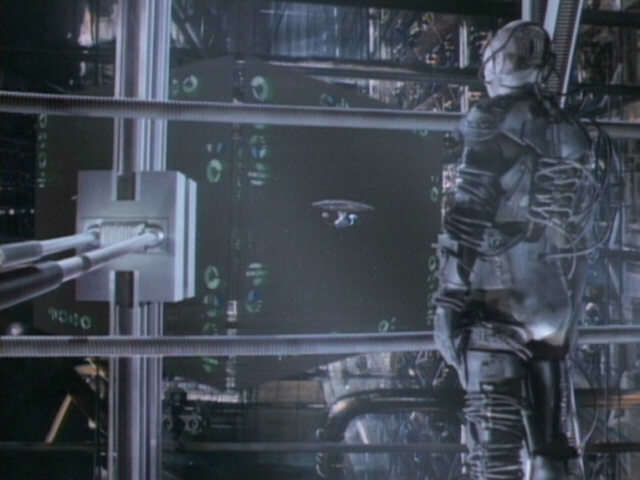 It was mirror-inverted for "Half a Life". 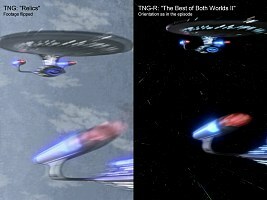 Because of its similarity to "our" flyby from "The Best of Both Worlds II", the HD version of "Half a Life" shows the version B and not the original footage that was obviously used for TNG-R: "The Best of Both Worlds I". The C-versions of the warp (1) and warp drop (2) shots are seen twice each in the remastered version of "The Host". 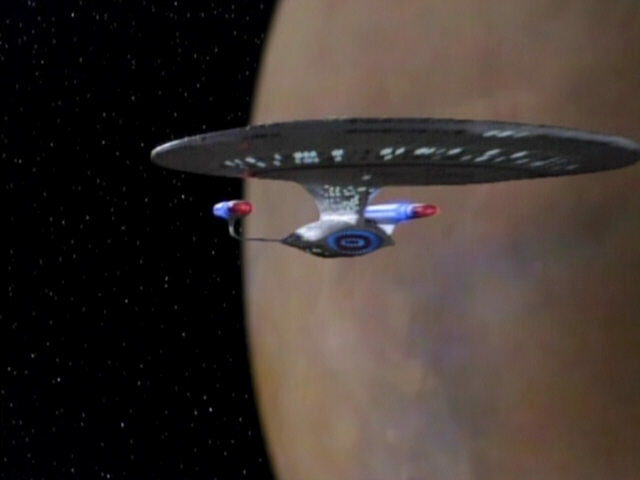 The C-version of the flyby (here only the warp shot 1) appears for the very last time in the last episode remastered by Modern VideoFilm, using this shot. 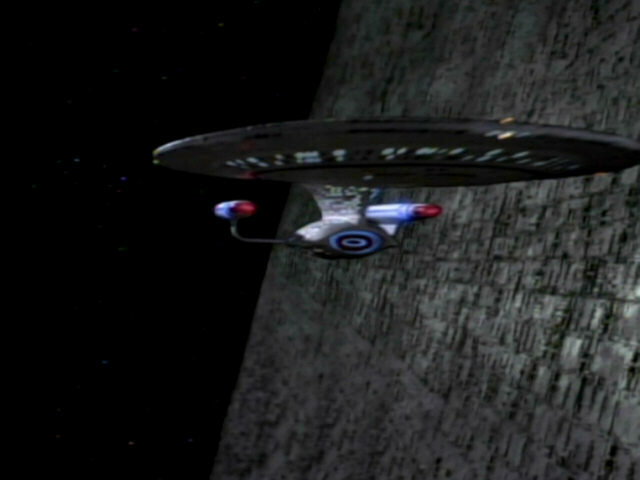 As the season 4 cliffhanger was remastered by CBS-Digital, the company did not use the CG model (C or E), but went back to the mirror-inverted physical model as already in "The Best of Both Worlds II" (A). 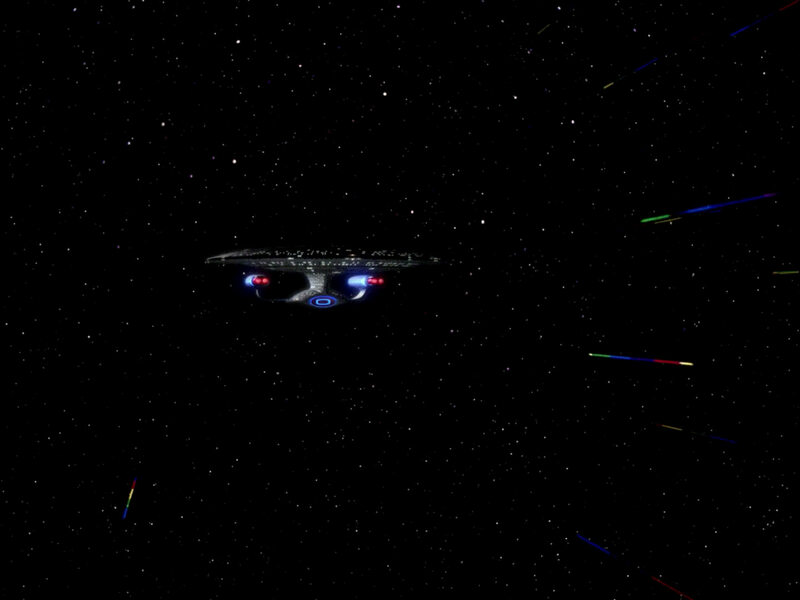 In "Redemption I", only the warp shot is (1) used. 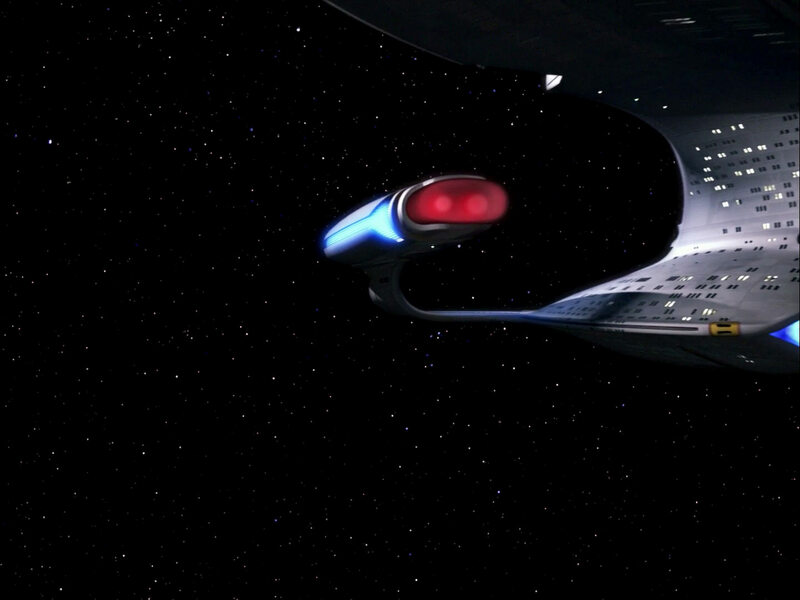 A new and much more detailed CG model of the USS Enterprise-D makes its debut in this episode (D). 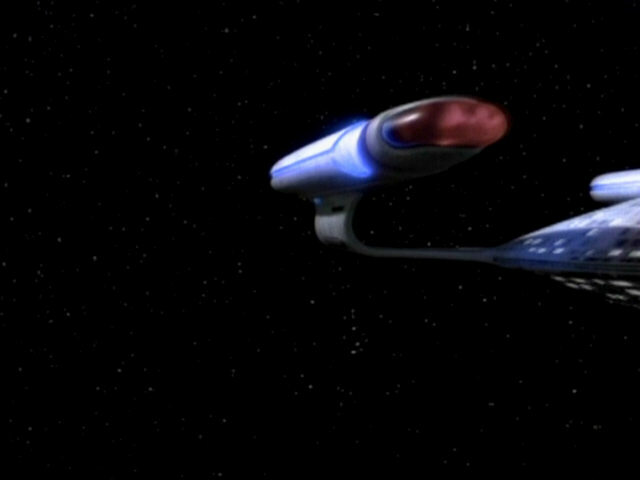 The new model is still based on Tobias Richter's model and hence on the 6-foot Enterprise, but it incorporates raised panels a bit like on the 4-foot model. 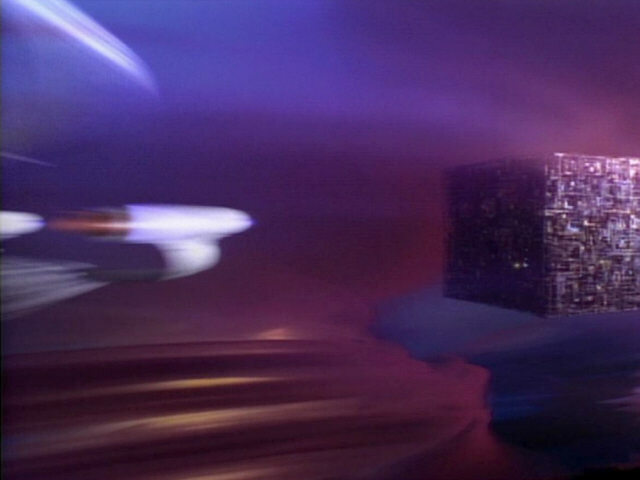 In this episode, it appears in the warp drop shot (2). 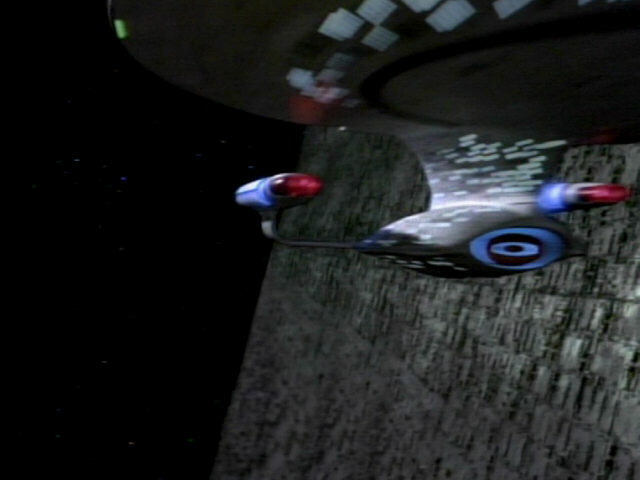 In the episodes "Silicon Avatar" through "Violations", the mirror-inverted A-version is still used for the warp and impulse shots, while the new CG model (D) appears in the warp drop shot. 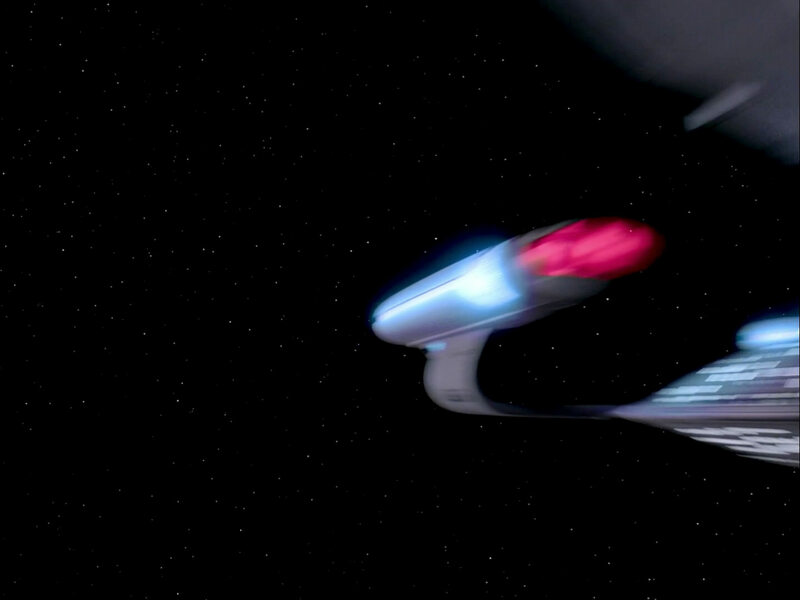 It seems the footage of the new CG model, showing the ship flying at warp and impulse, was not finished in time for inclusion in the early season 5 episodes. 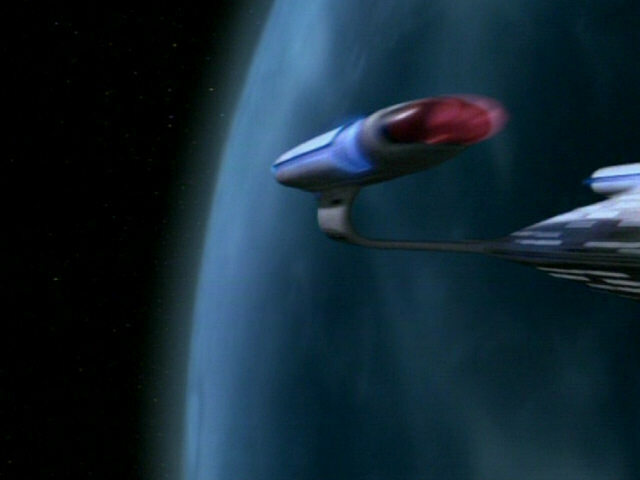 This is the first episode in which all three versions of the flyby, the warp (1), warp drop (2) and impulse (3) versions are seen. The new warp and impulse flybys, using the new CG model first seen in "Ensign Ro", were finished in time for "Conundrum". 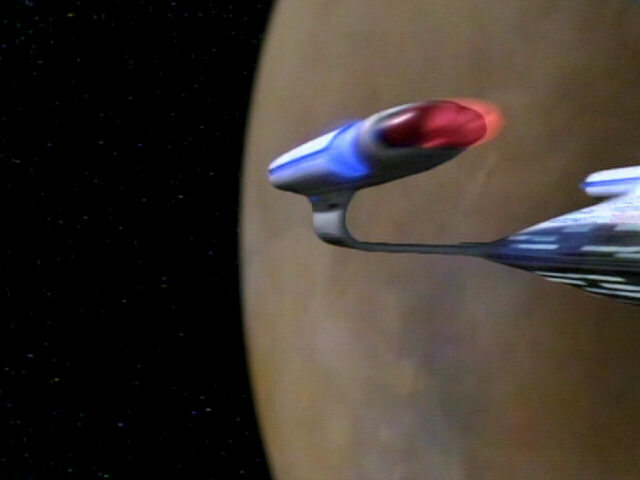 From now on, only the new elaborate model created by CBS-Digital (D) is seen on the show. 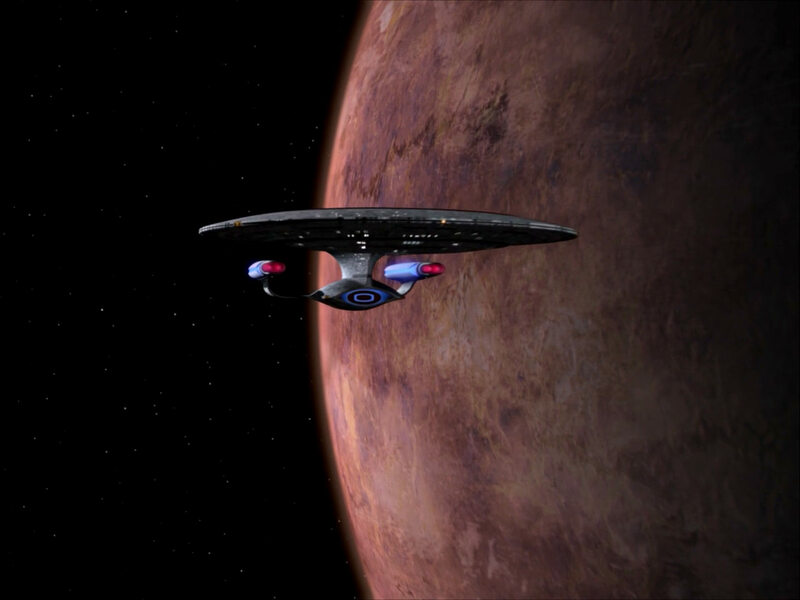 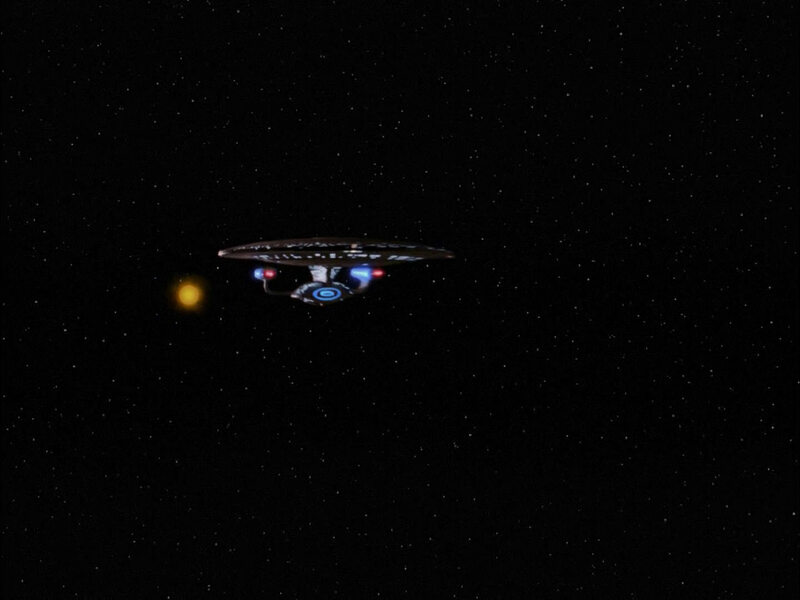 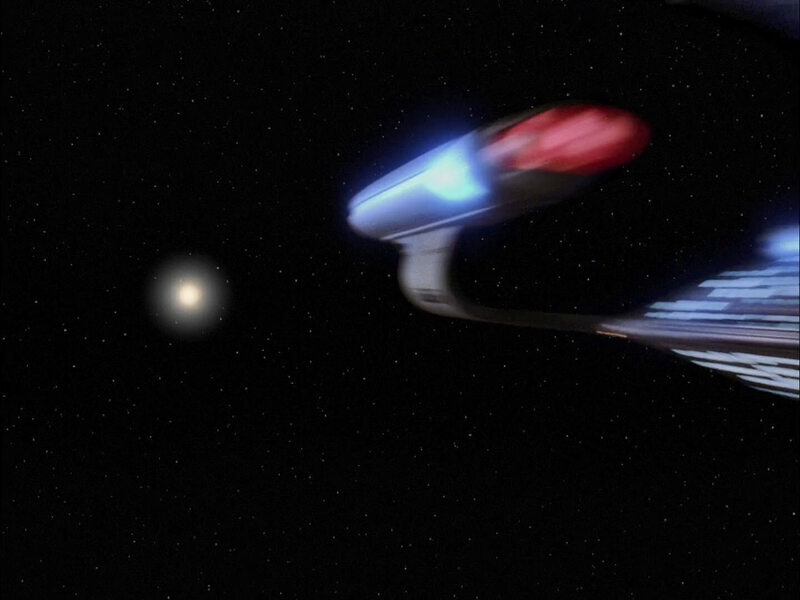 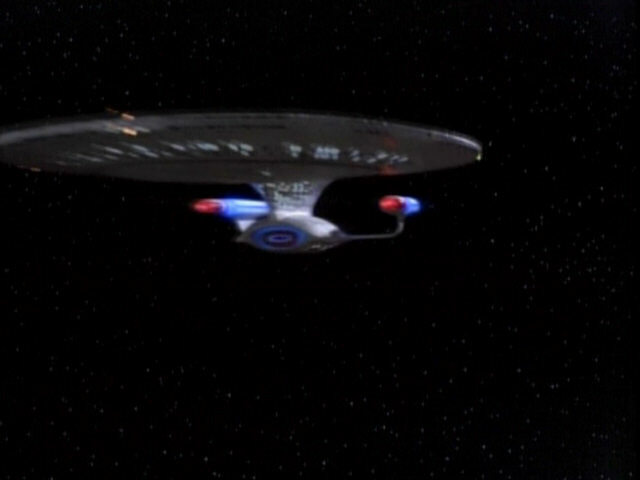 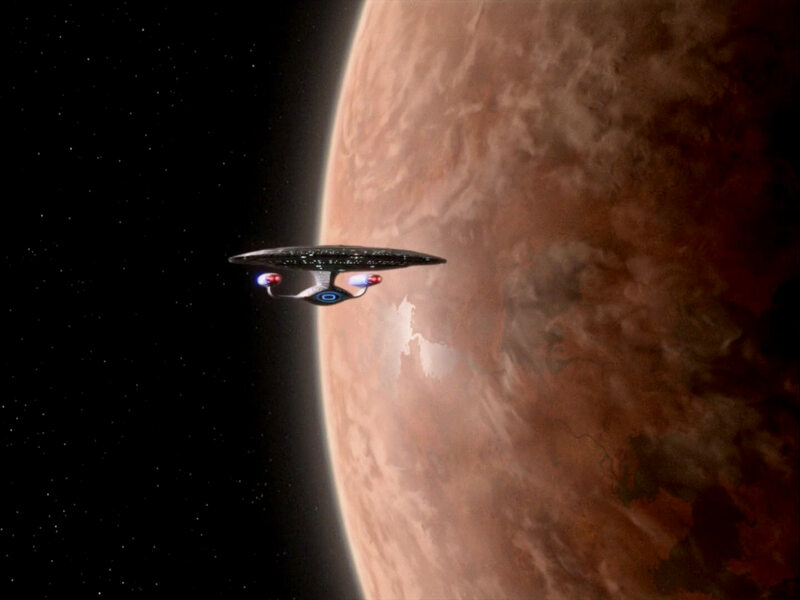 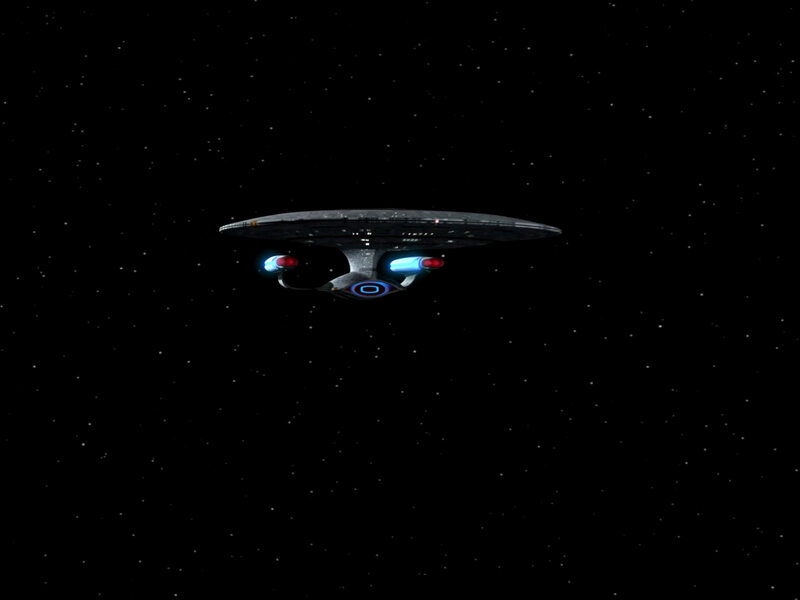 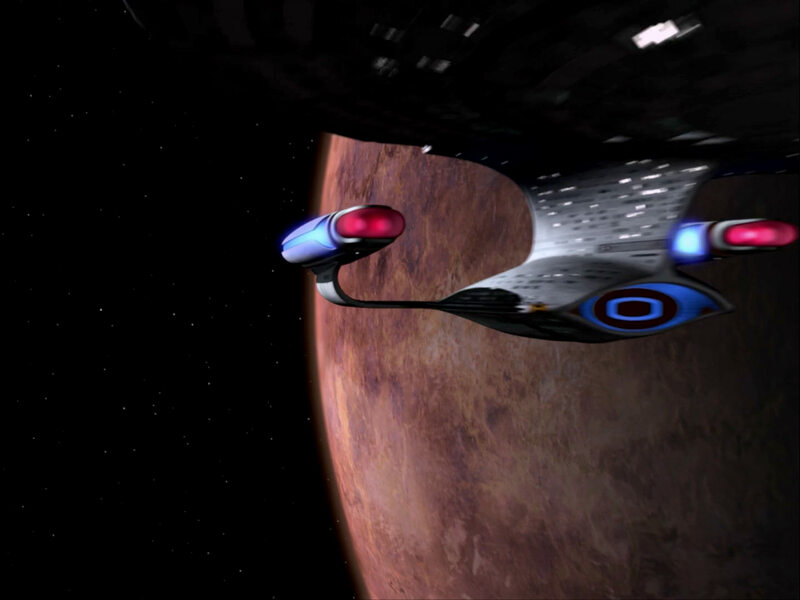 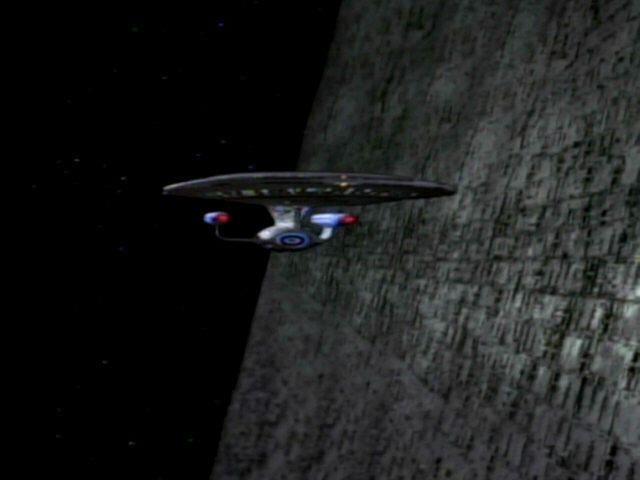 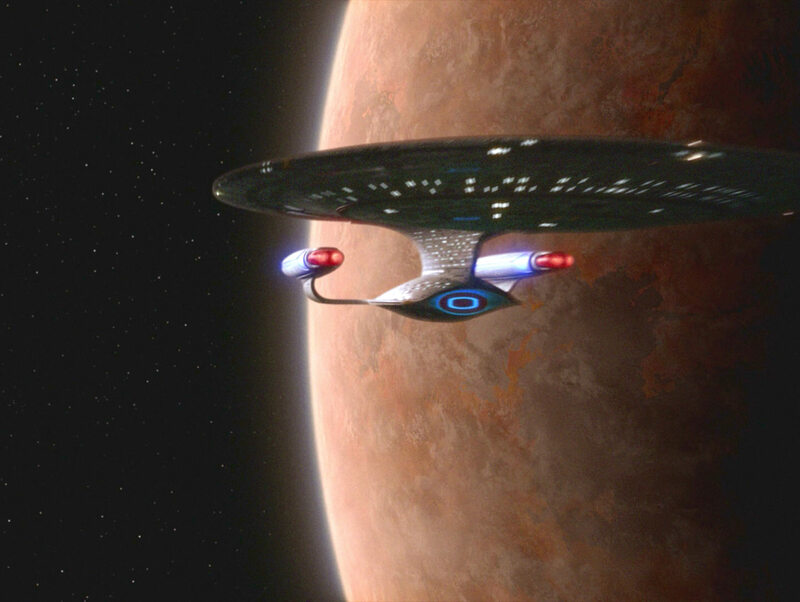 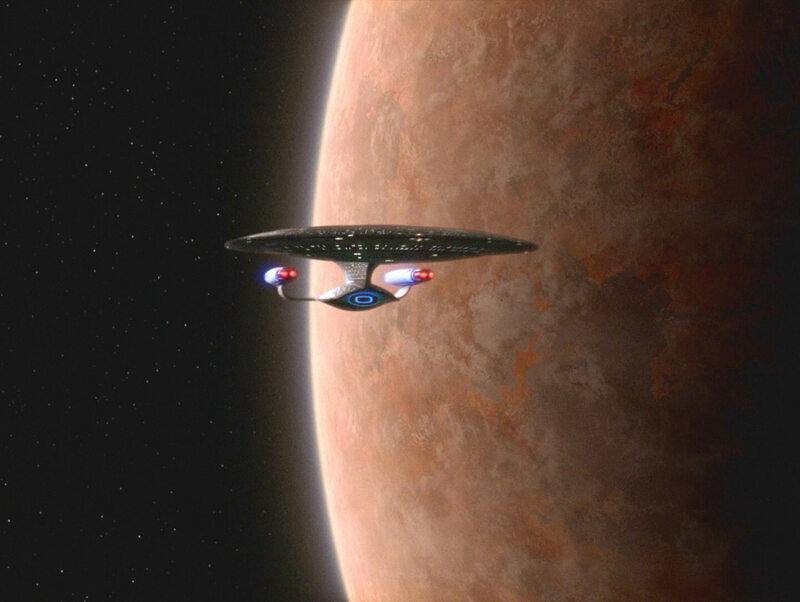 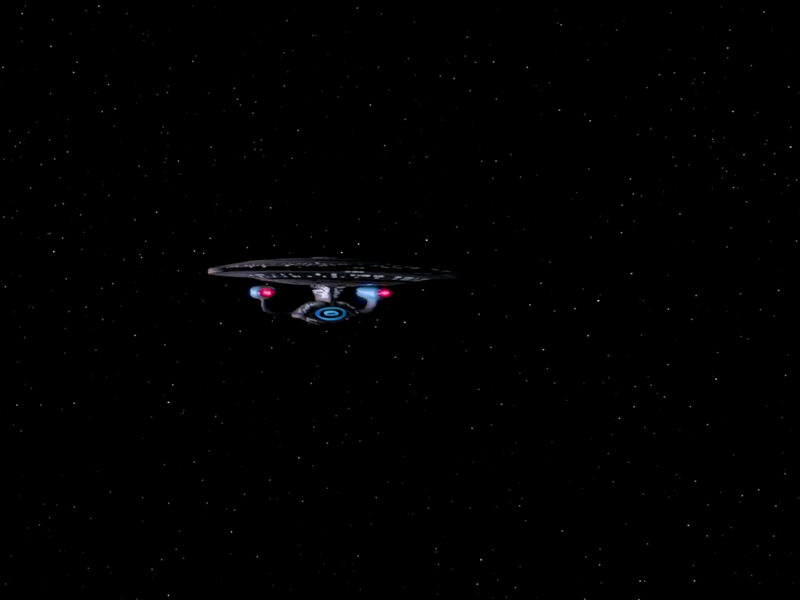 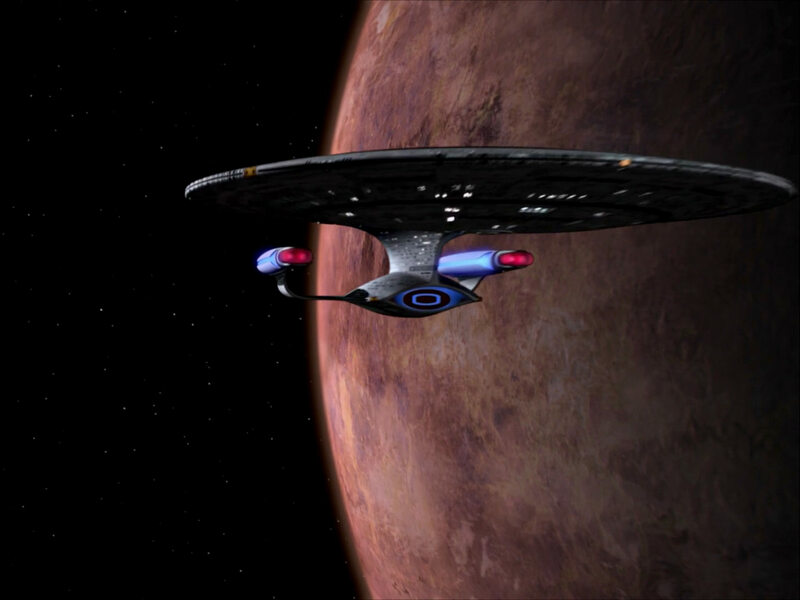 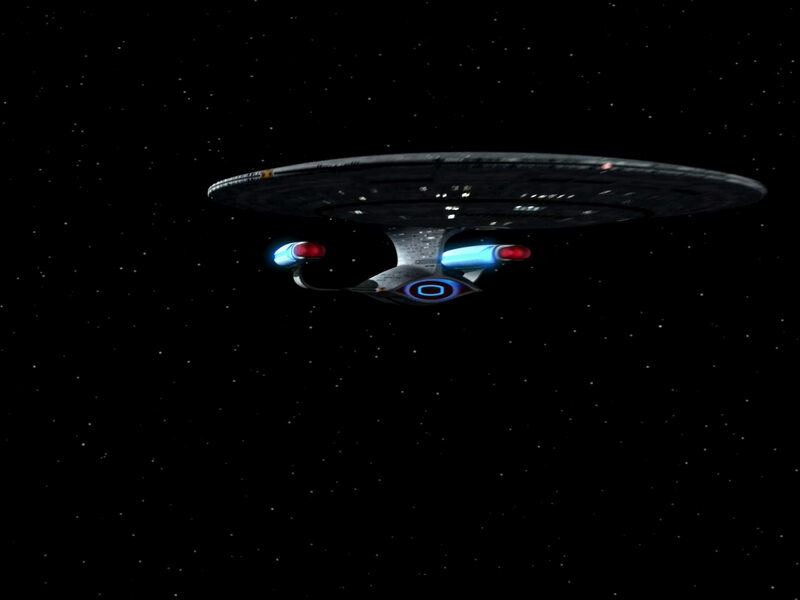 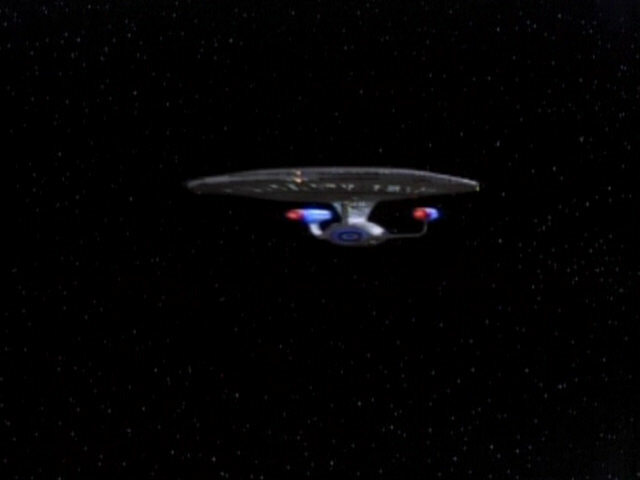 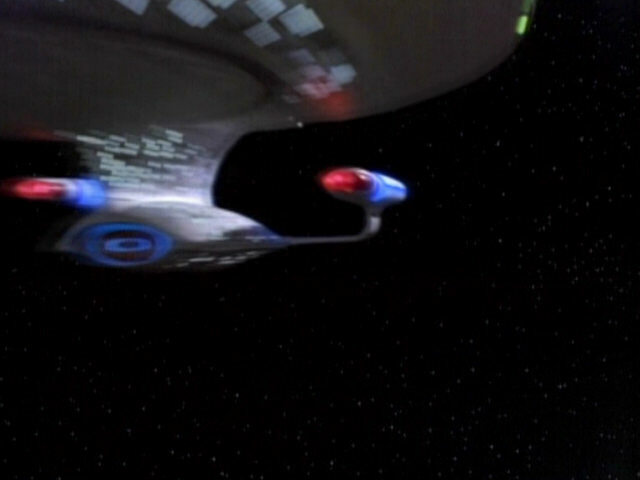 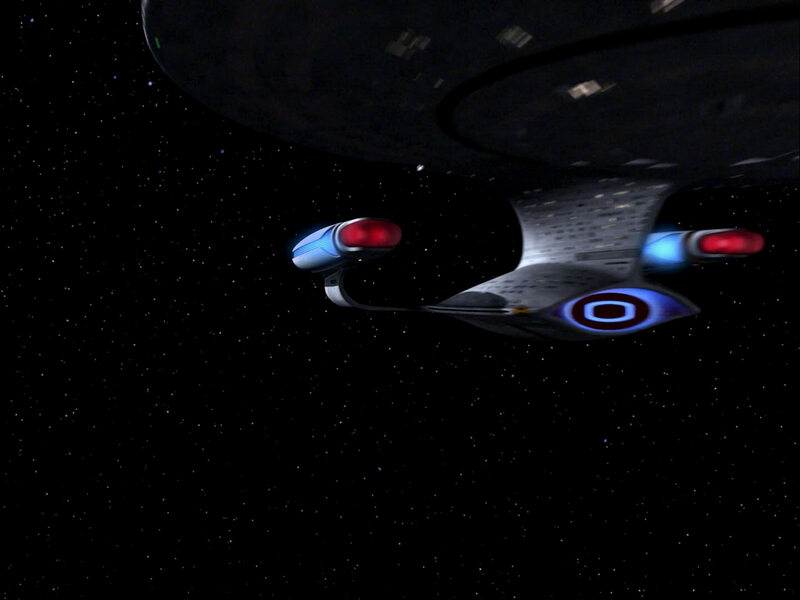 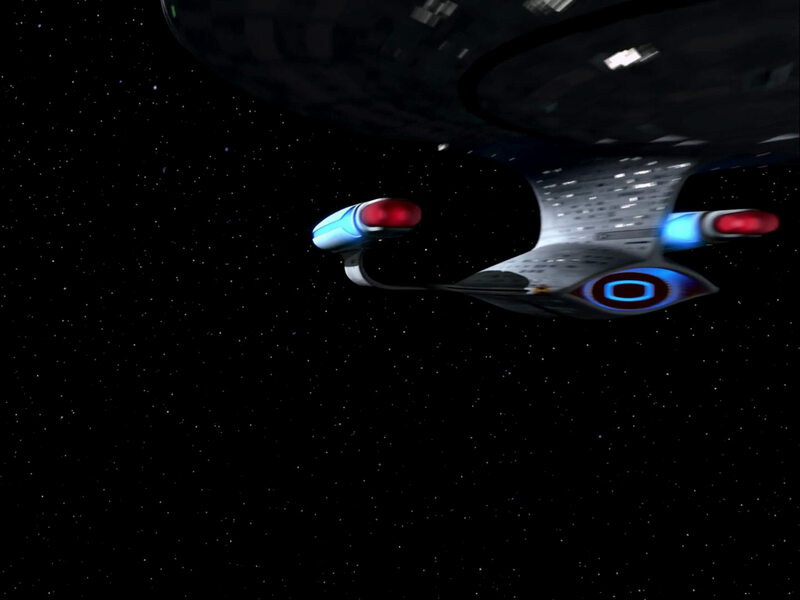 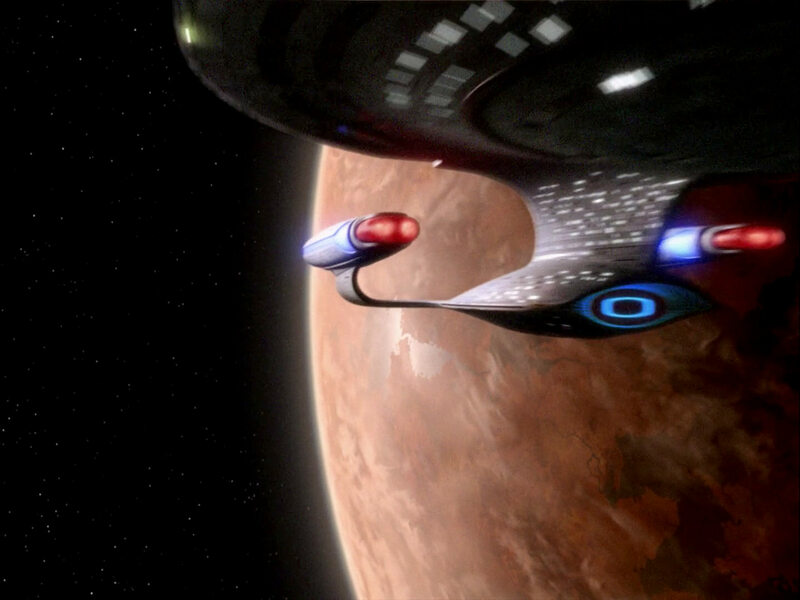 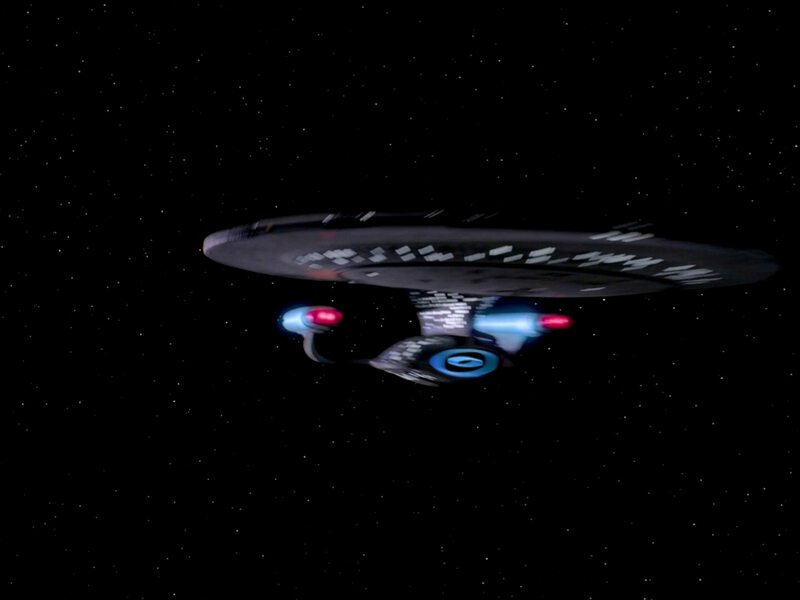 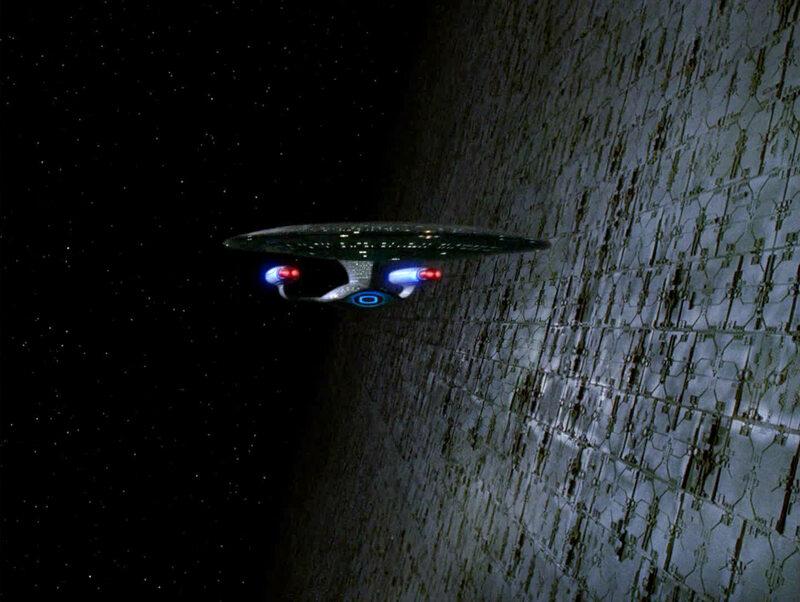 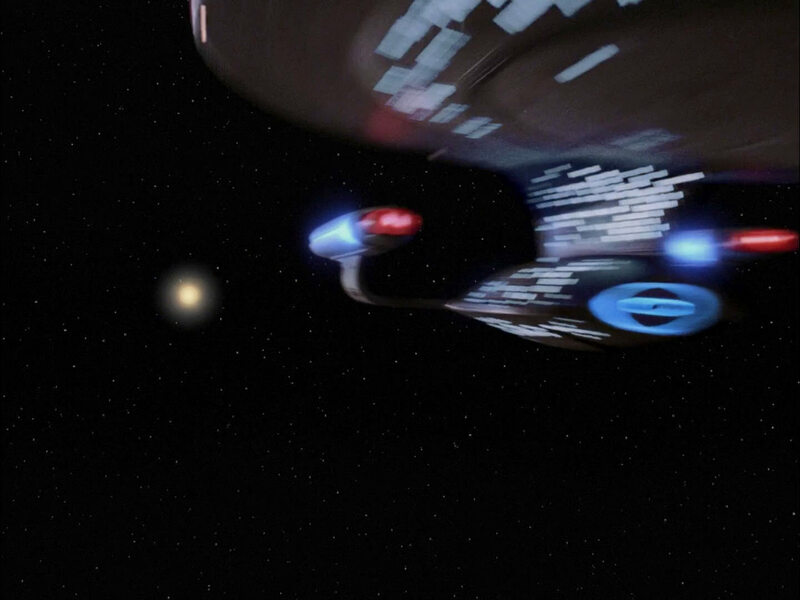 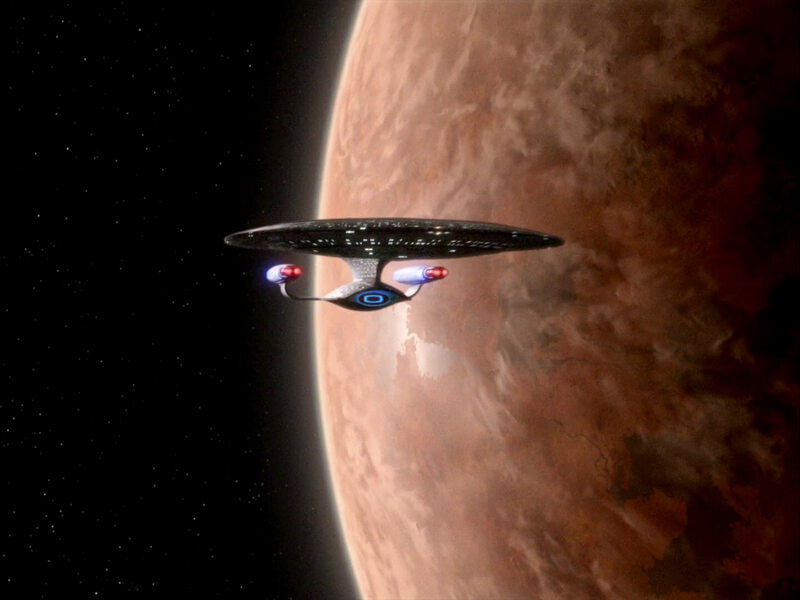 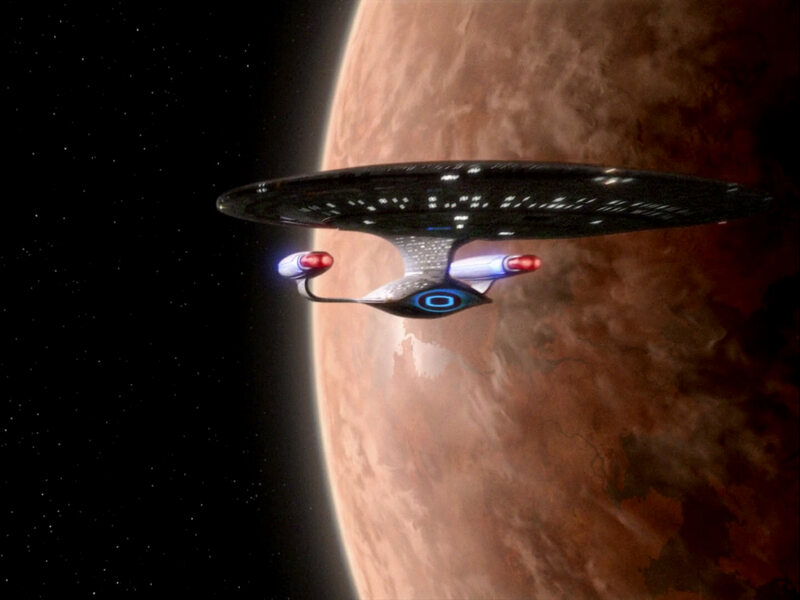 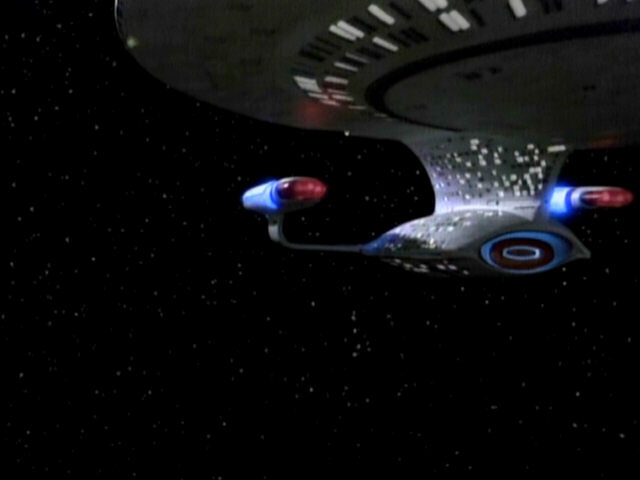 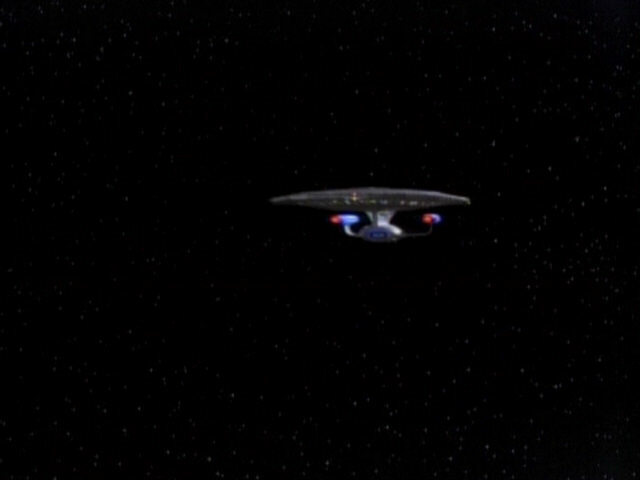 In the original SD version of the episode, footage from "Identity Crisis", showing the USS Enterprise-D leaving orbit of a planet (Tarchannen III in that episode) was re-used halfway through the episode when the ship leaves orbit of a planet in the Mericor system. 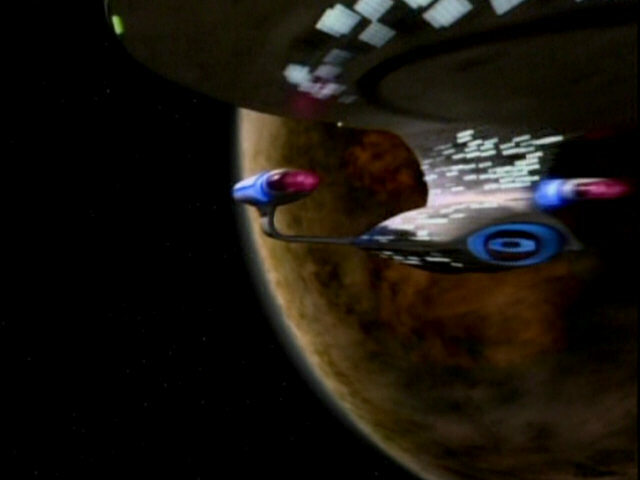 For the remastered version of the episode, the shot was created completely anew, using a new planet and footage of the D-model at impulse, as first seen in "Conundrum". This is the second episode in which all three shots appear, again, using the D-version of the flyby shots. It is also the episode with the most flybys (a total of 5). 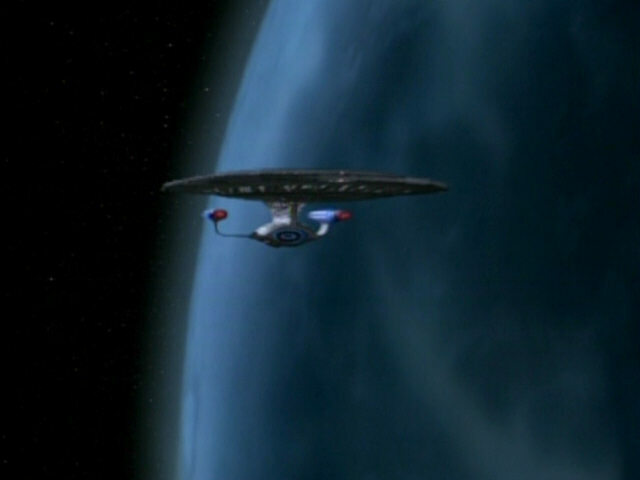 At the end of the episode, the USS Enterprise-D is seen leaving FGC 47. 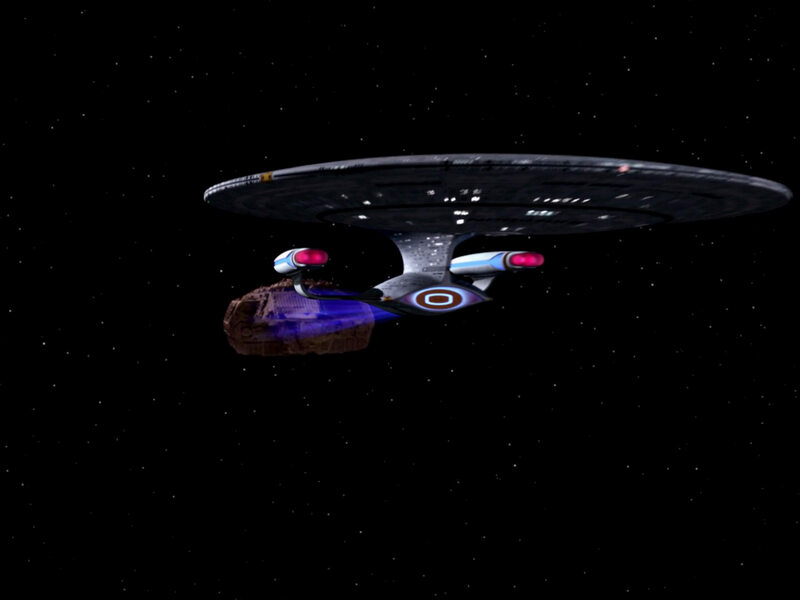 The impulse version (3) of the flyby was used here and the ship is bathed in red light, emanating from the nebula. 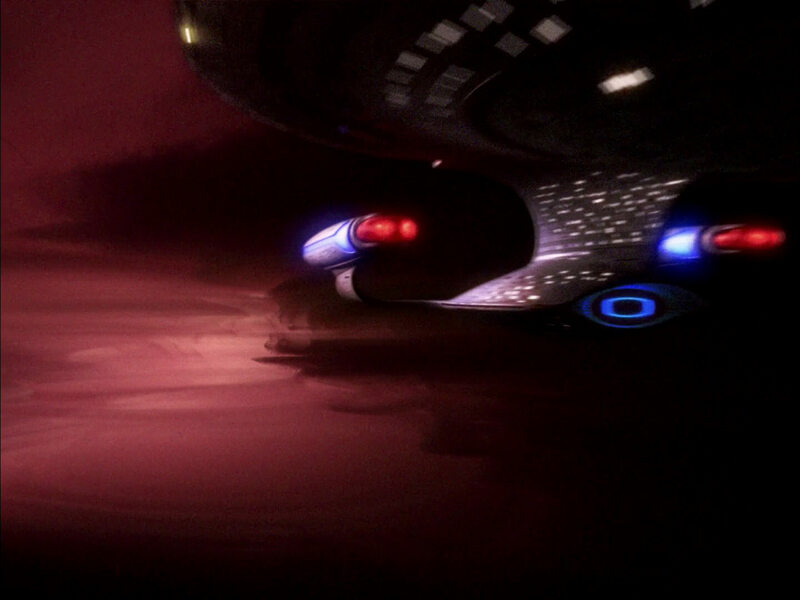 The remastered version of the episode accordingly shows the CG model (D) bathed in red light. 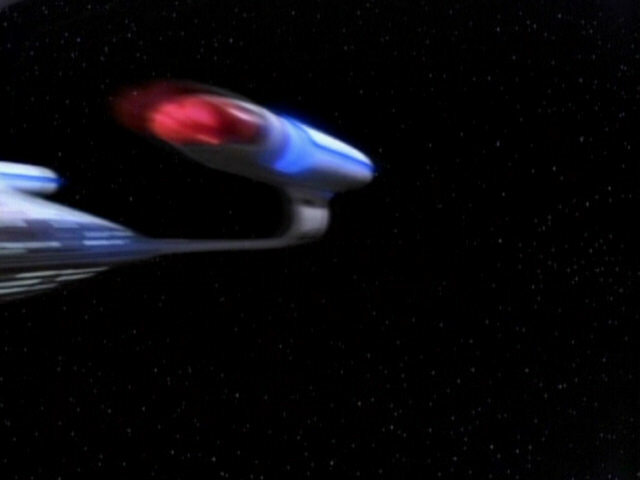 Only the warp drop flyby (2) is seen early in the episode. 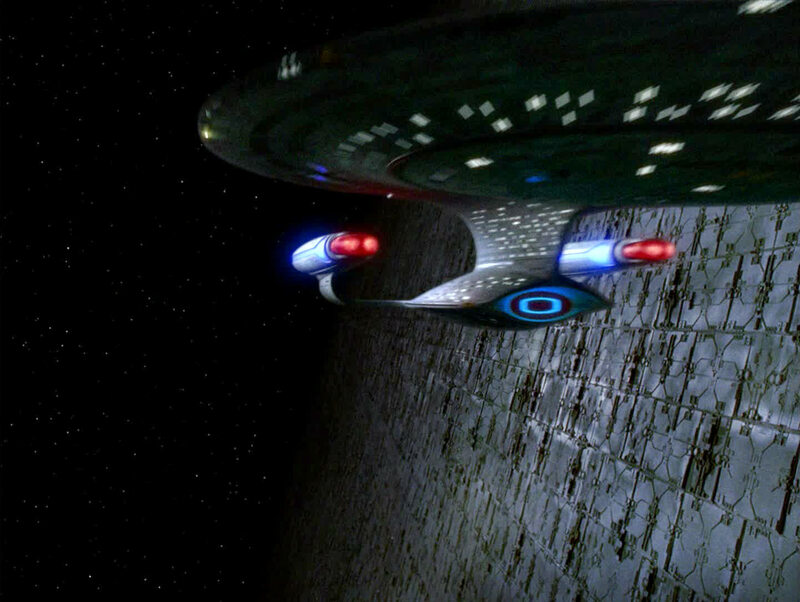 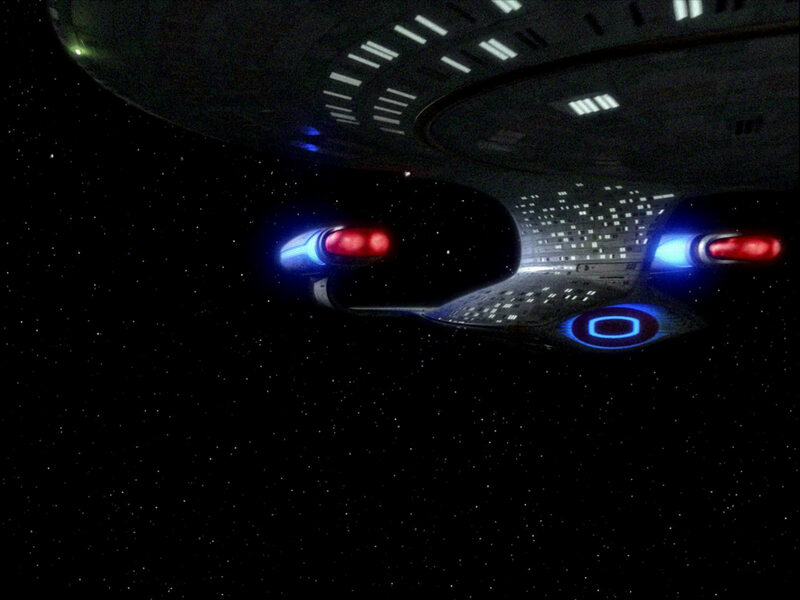 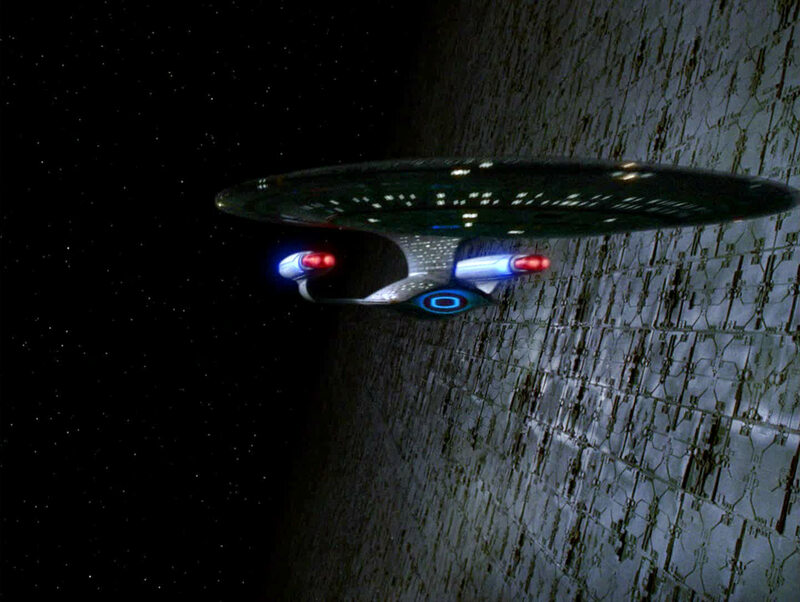 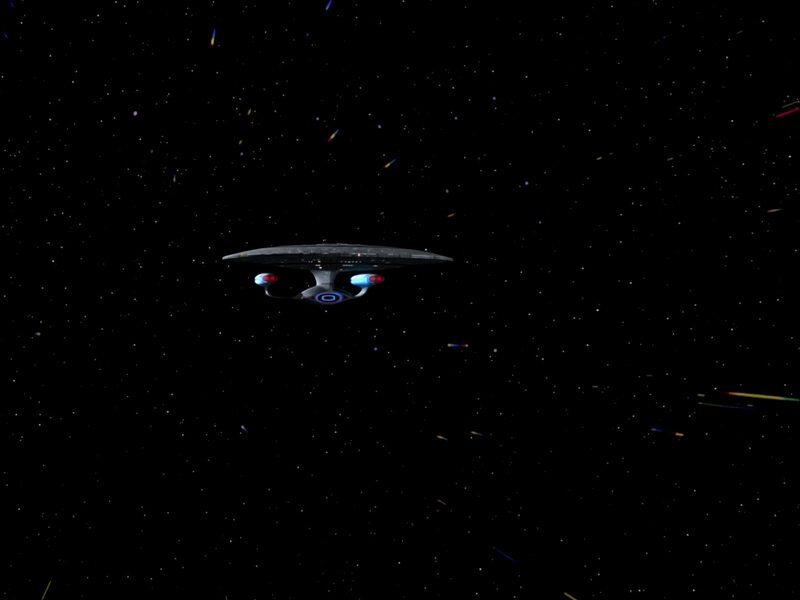 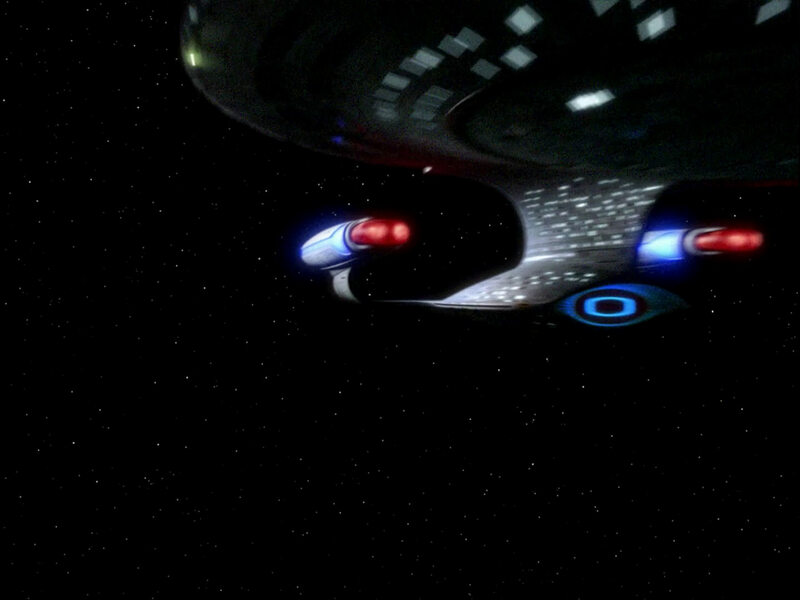 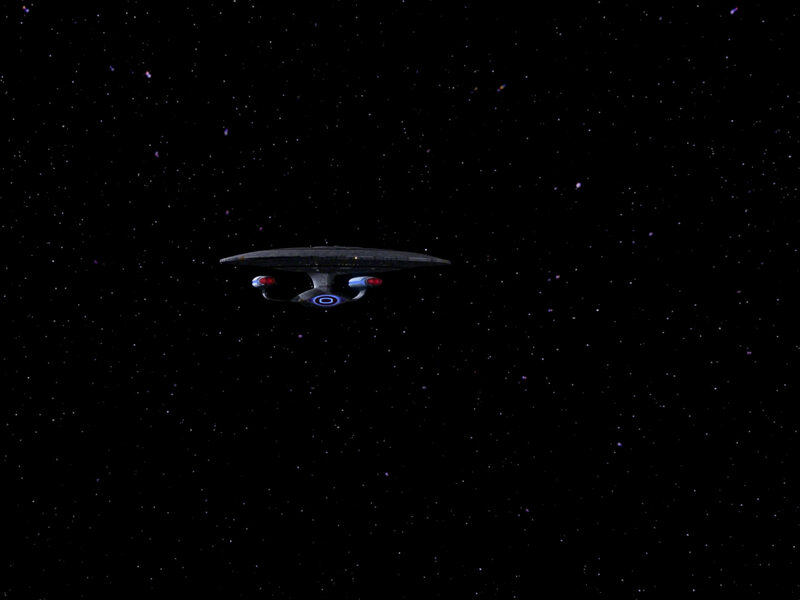 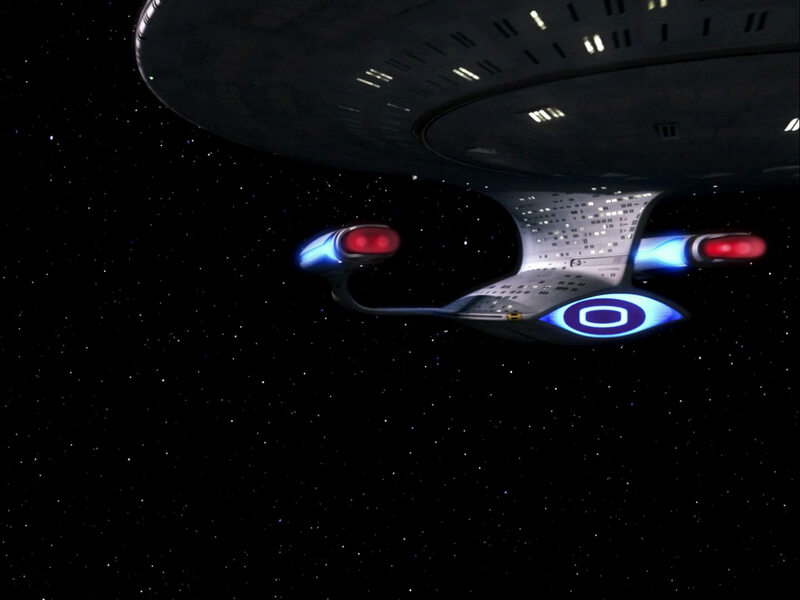 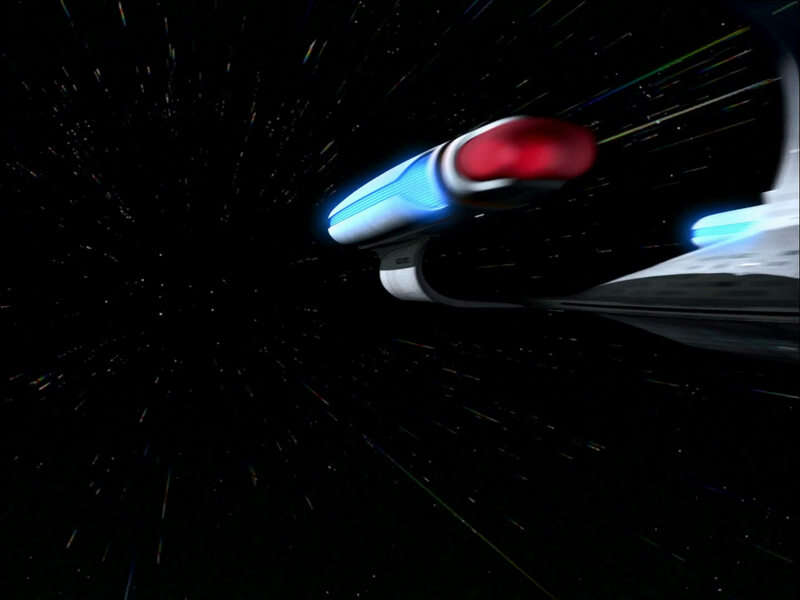 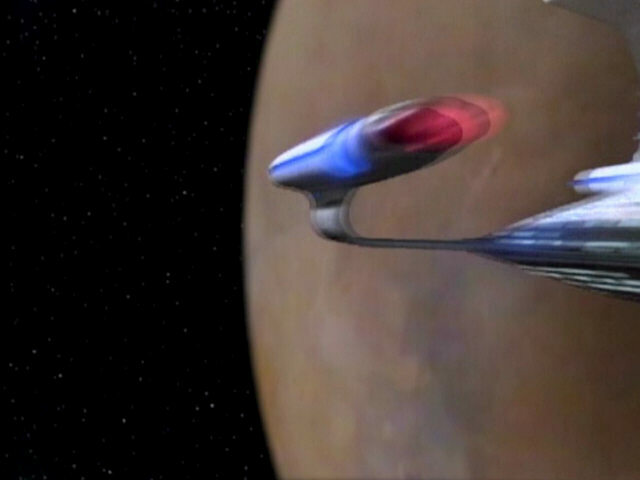 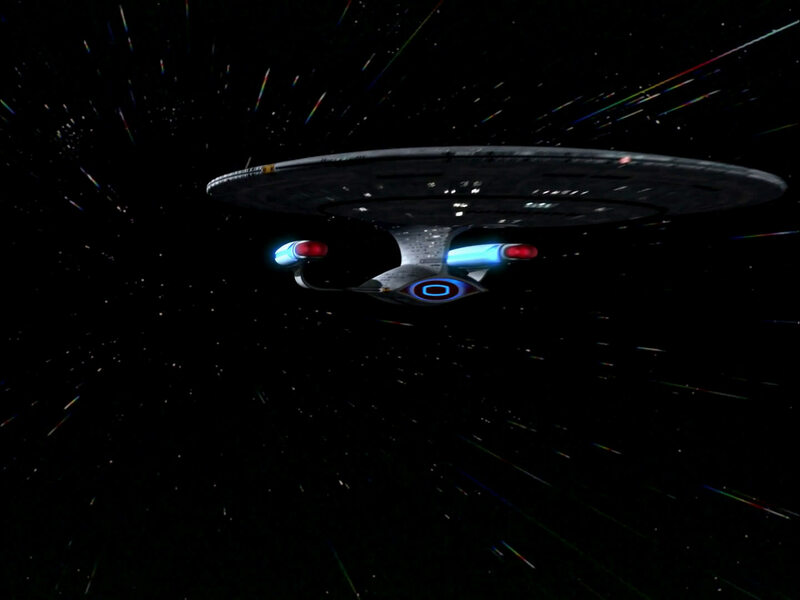 As "The Inner Light" was one of the first episodes to be remastered for the "The Next Level" sampler Blu-ray disc, together with "Encounter at Farpoint" and "Sins of the Father", a unique version of the flyby, only seen in this episode and using the early CG model of the USS Enterprise-D (created by Tobias Richter) appears in the remastered "The Inner Light" (E). 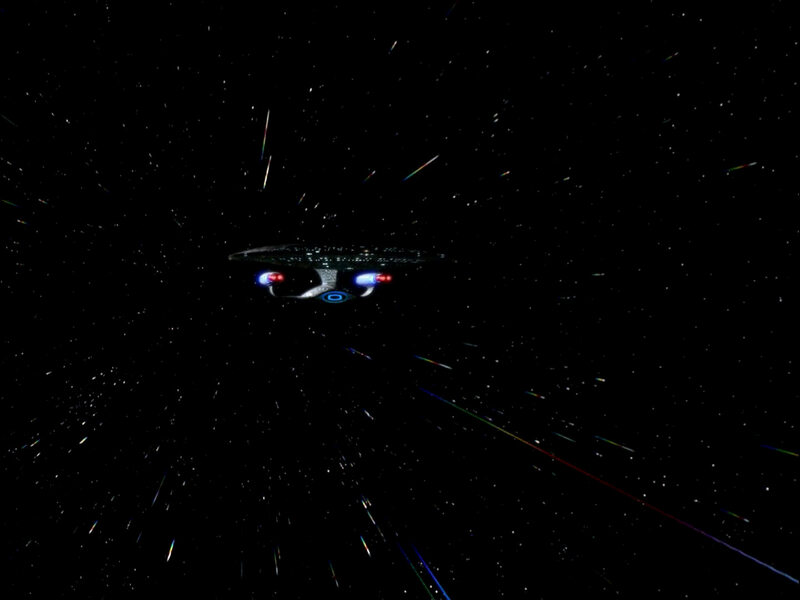 This brings the total of different CG versions of the flyby to five unique shots. 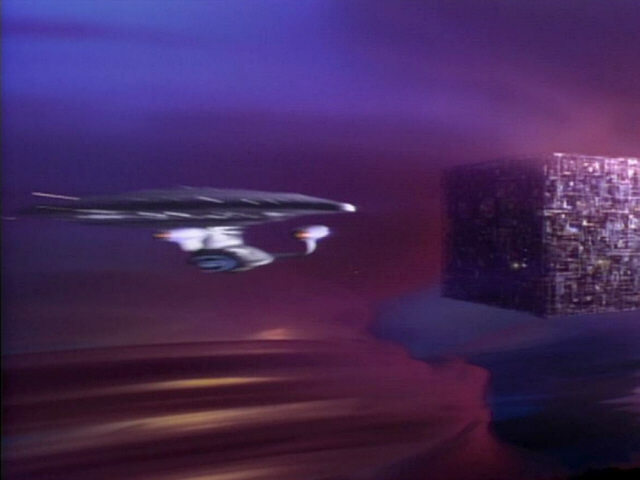 "Relics" is also the origin of the shots A & B that stand in for the original shot in the 4th season of TNG-R. 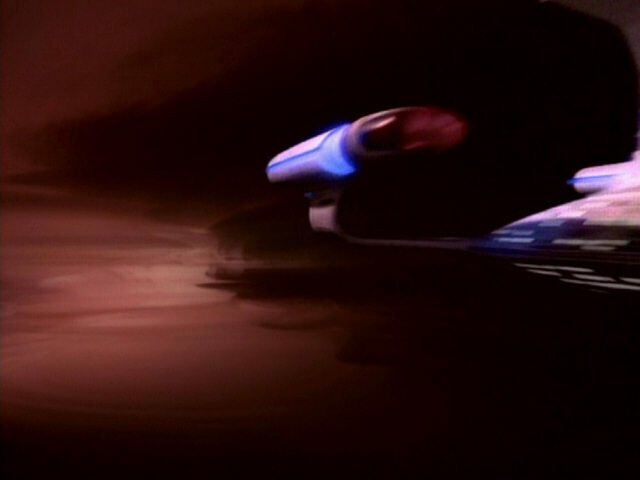 Here are further occurrences of the original shots in episodes seasons 6 and 7. In this episode the original footage is mirrored. 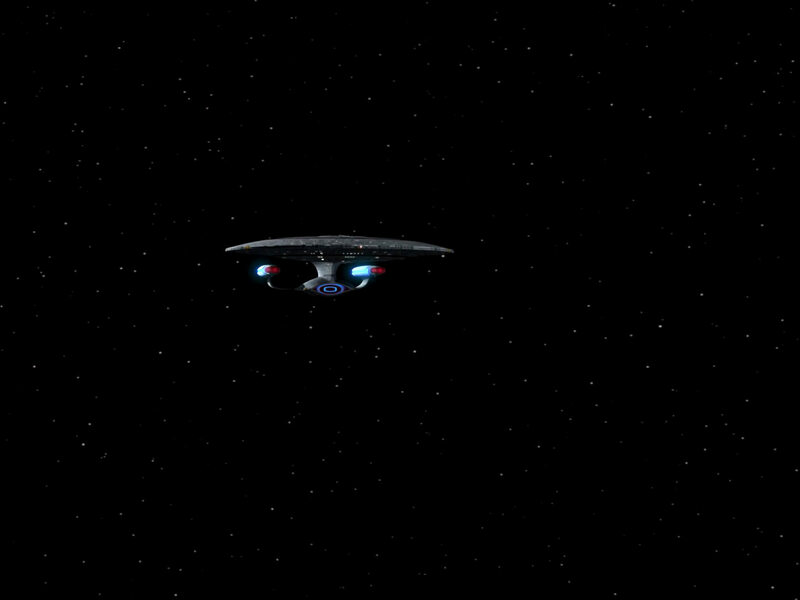 This is the only occasion where the shot doesn't show the Enterprise-D (but the Odyssey). 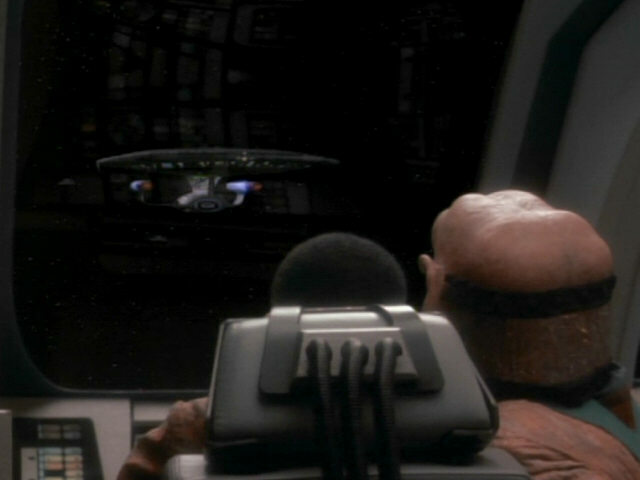 The ship can be seen through the cockpit window of the runabout. 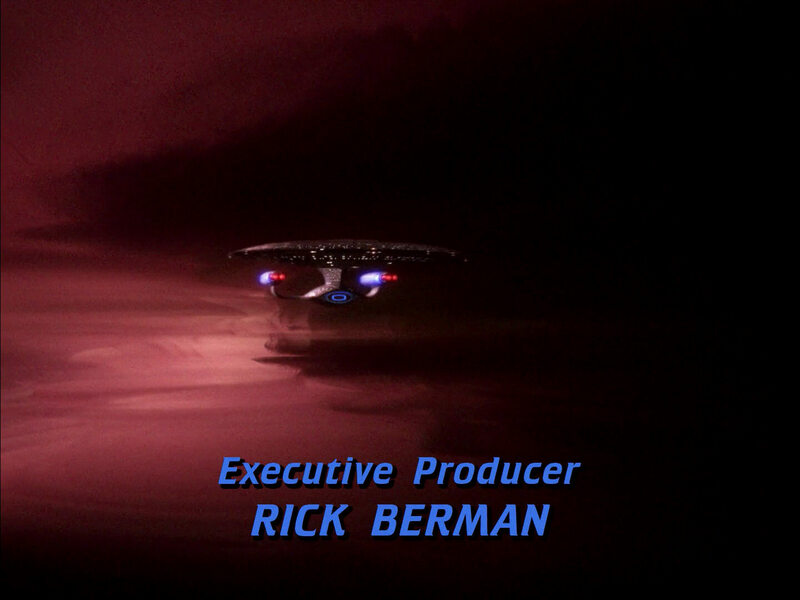 Episode "The Drumhead" "The Best of Both Worlds II" "Brothers" "The Host" "Conundrum" "The Inner Light"
"Final Mission" "Identity Crisis" "Ethics" "Imaginary Friend"